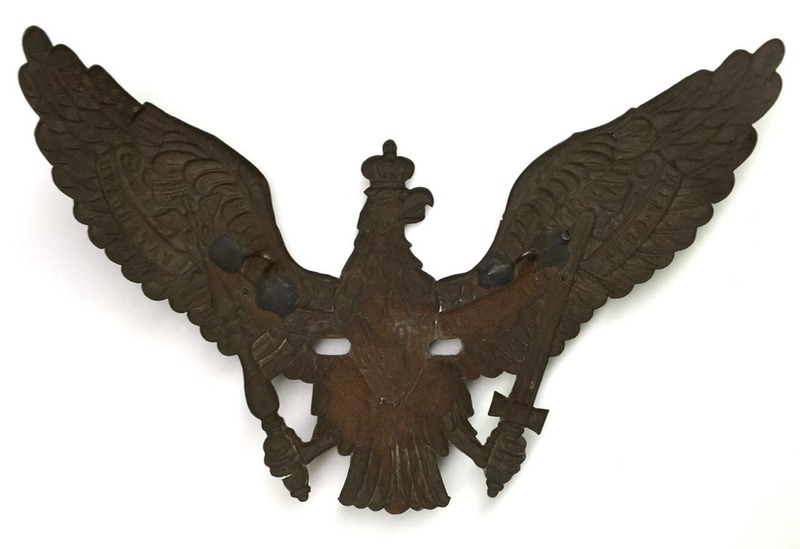 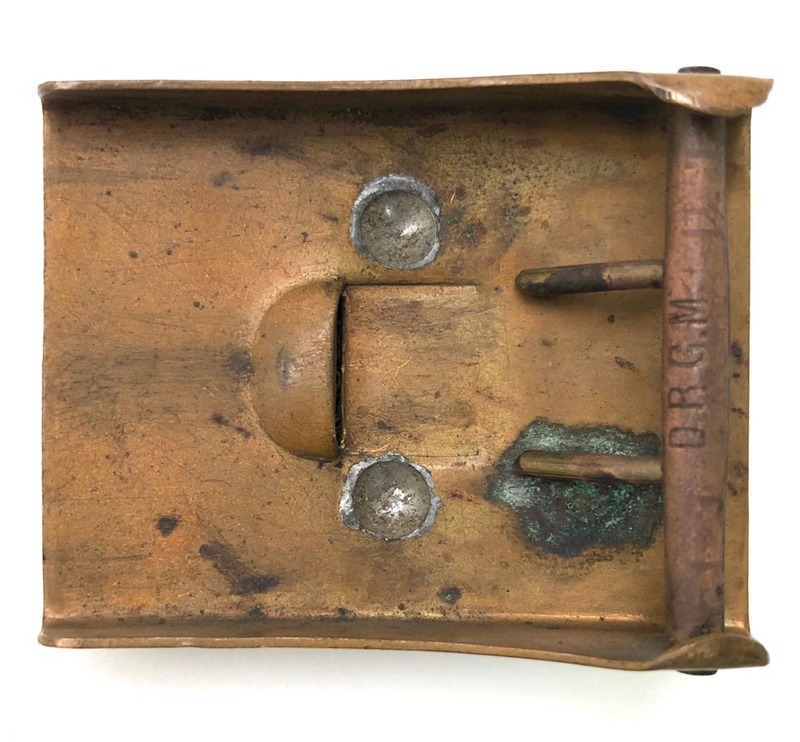 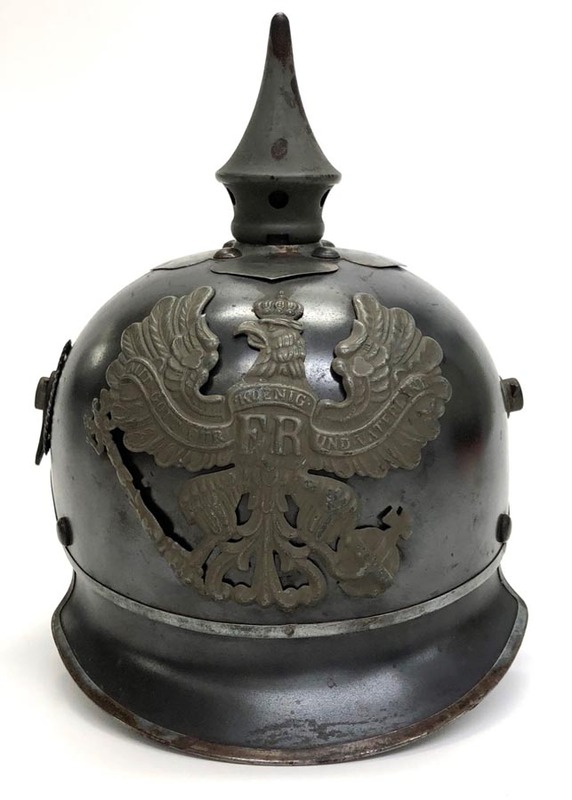 PHYSICAL DESCRIPTION: Prussian Garde frontplate is in nice condition showing some light age. 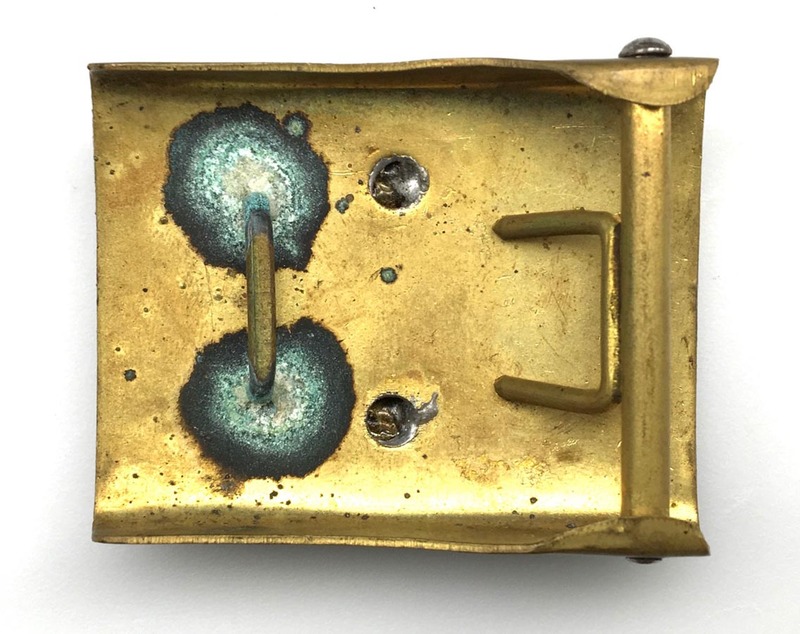 Both attachment posts are present to backside. 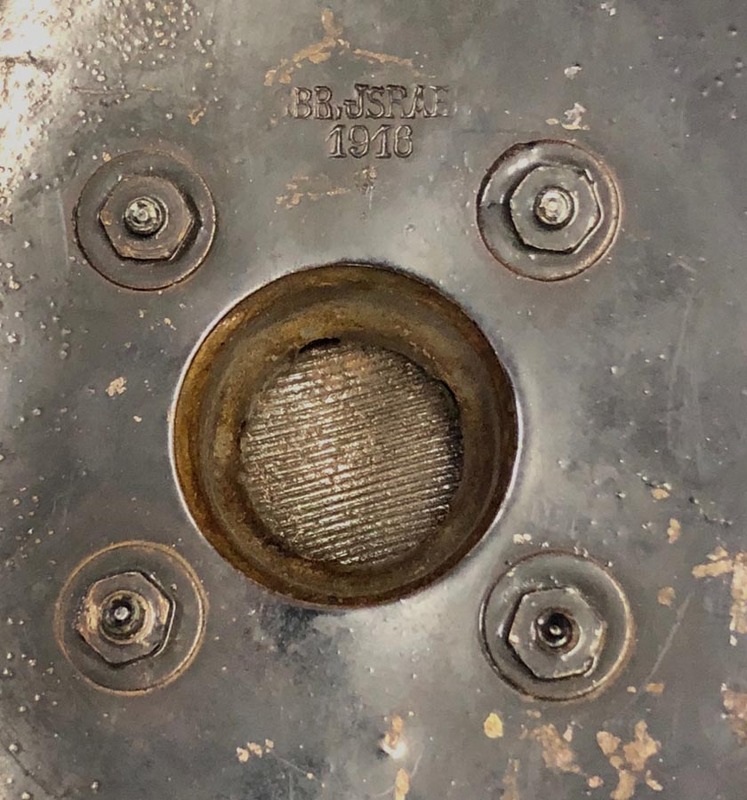 Grade star is missing. 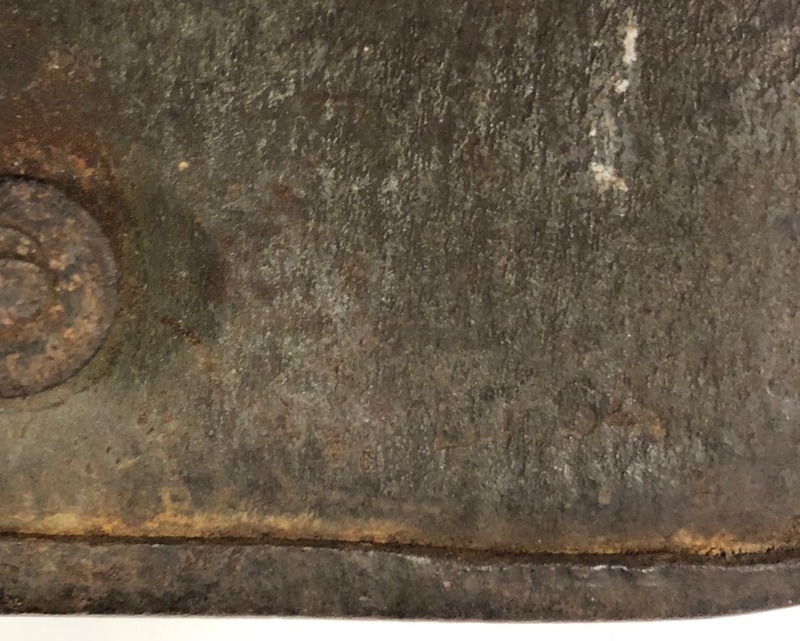 Light rust to back. 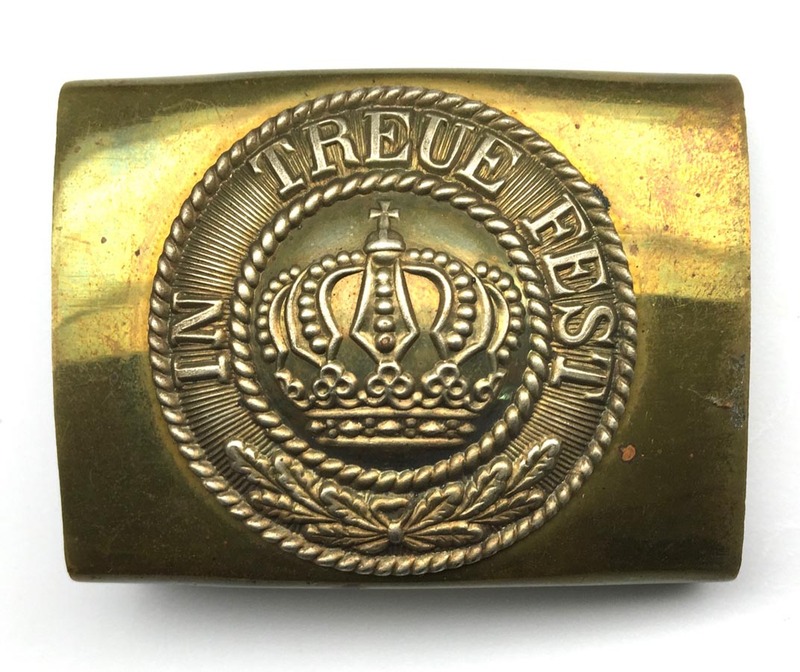 PHYSICAL DESCRIPTION: WW1 Prussian belt buckle in nice condition showing some light wear. 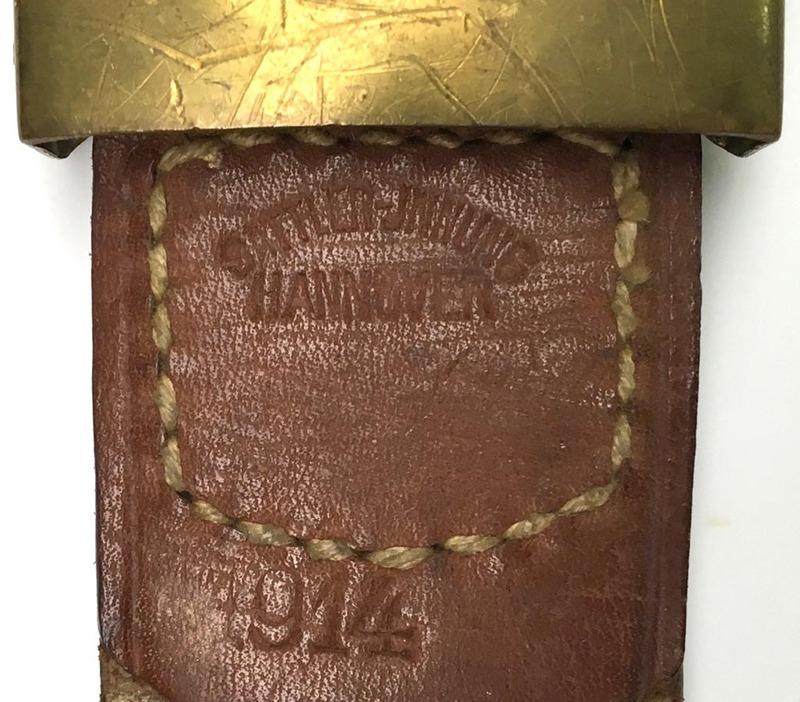 Leather tab is dated 1914 and maker marked what appears to be : Sattler-Jnnung Hannover. 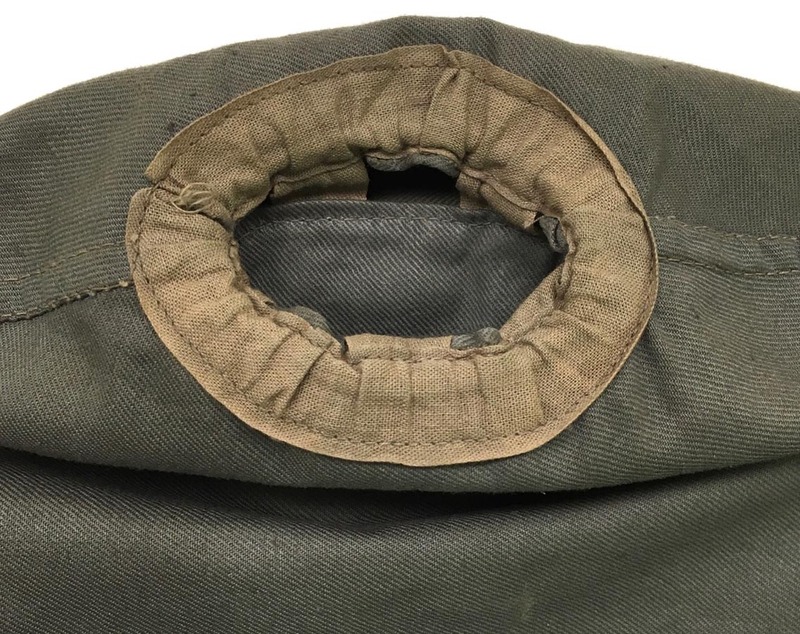 Tab is in real nice condition with all stitching intact. 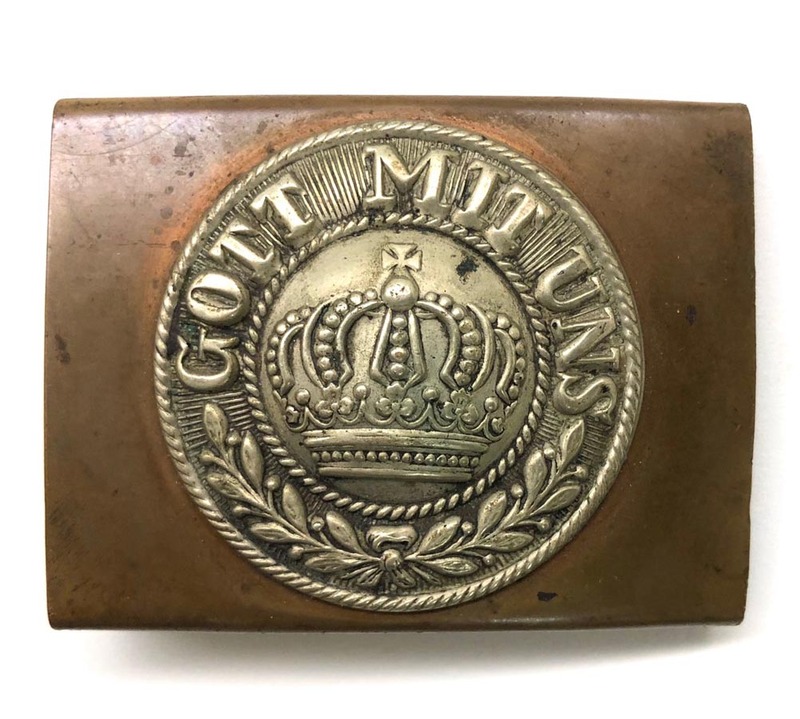 PHYSICAL DESCRIPTION: This Prussian belt buckle is in nice condition showing some age and wear. 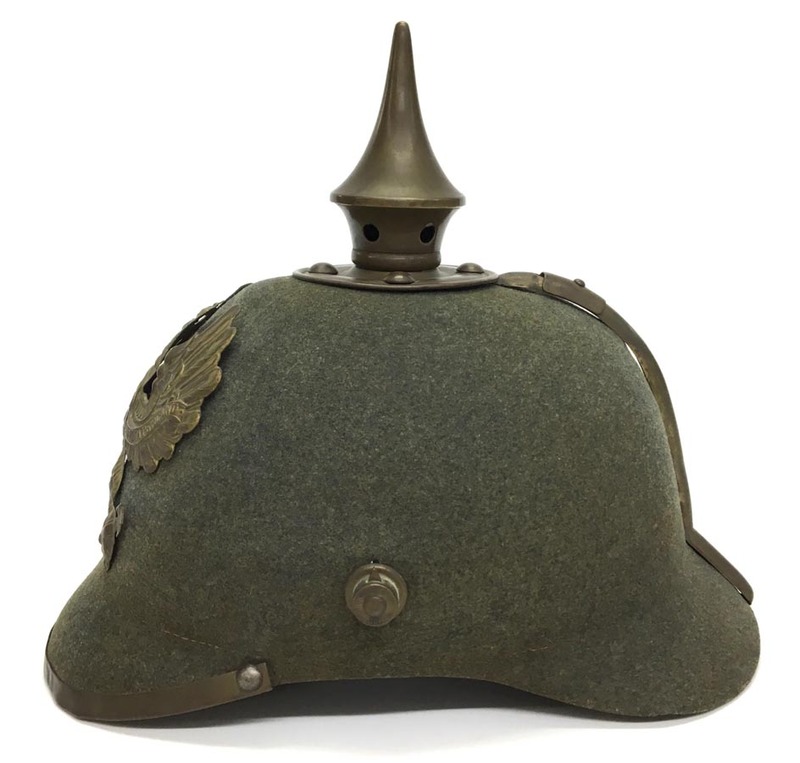 Original field grey paint is approximately 70%. 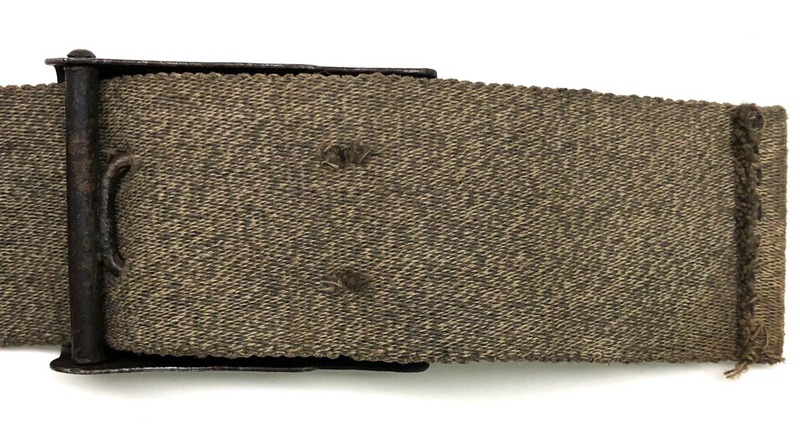 Leather tab is nice with all stitching intact. 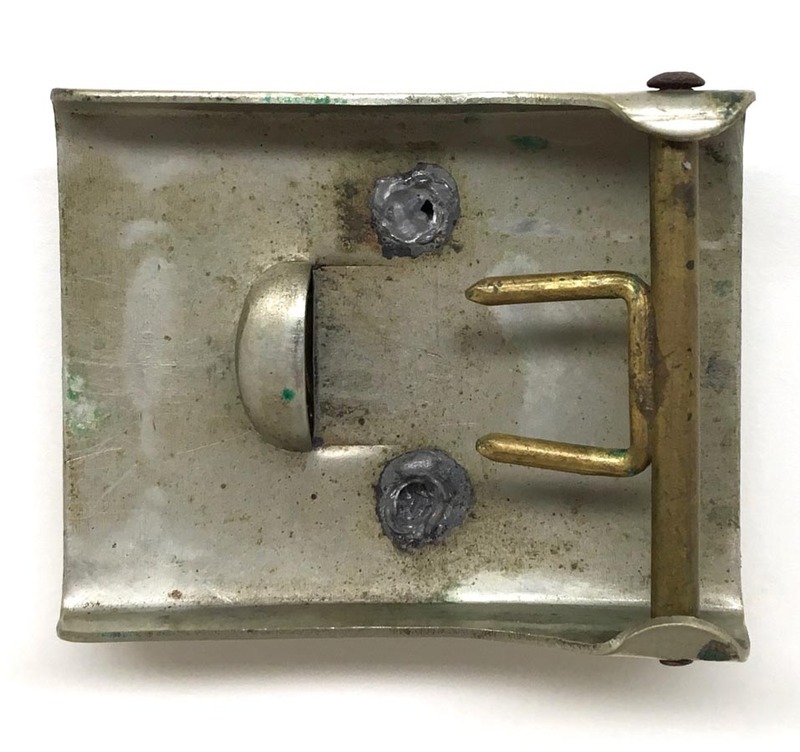 Tab is maker marked and dated : Jos. 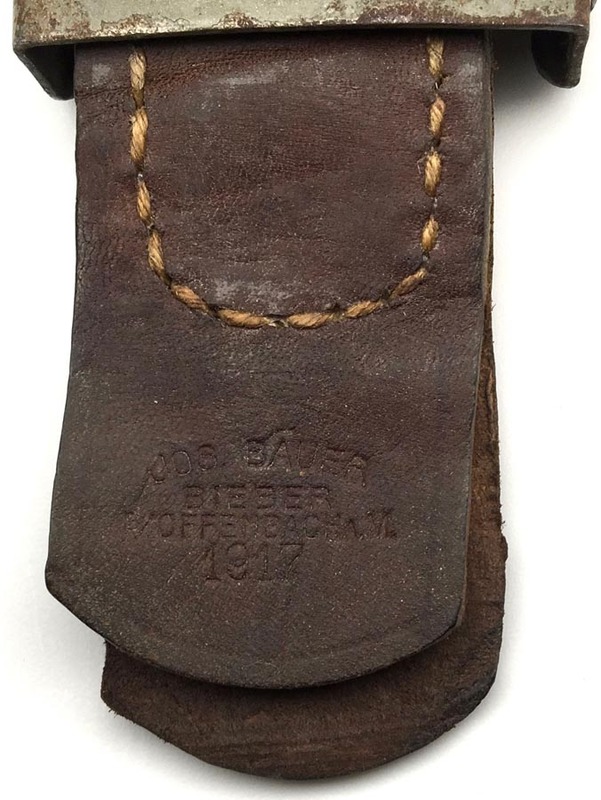 Bauer Bieber B/Offenbach A.M. 1917. 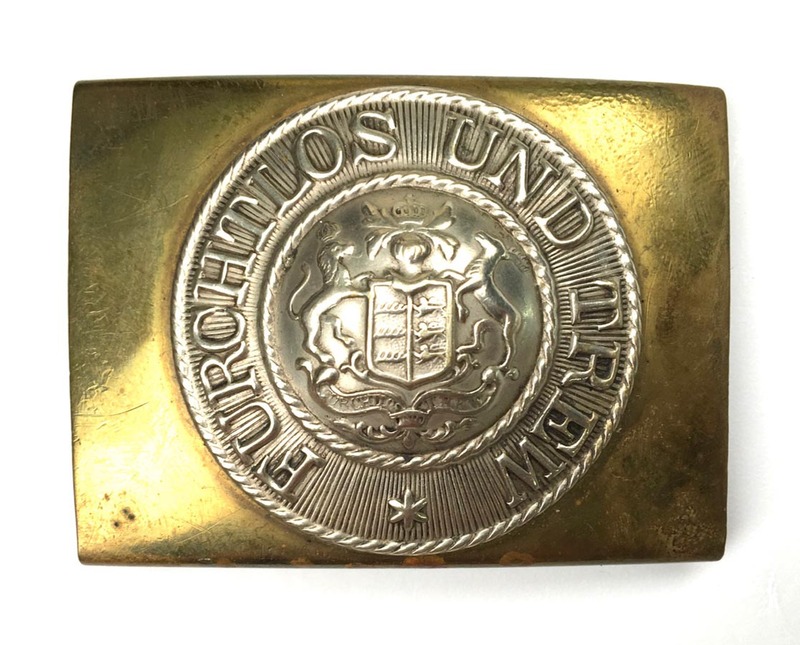 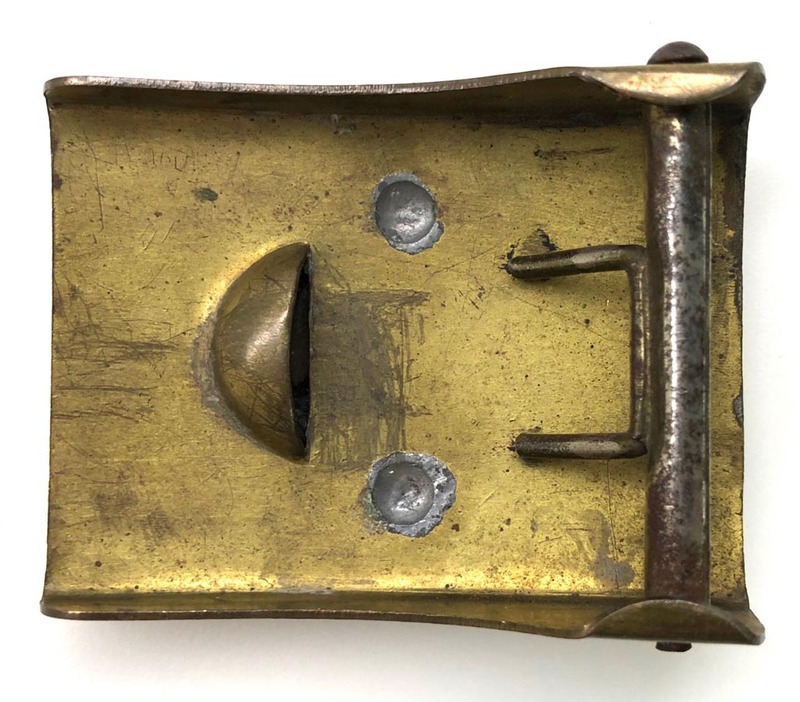 PHYSICAL DESCRIPTION: Bavarian brass buckle in excellent condition showing only light wear. 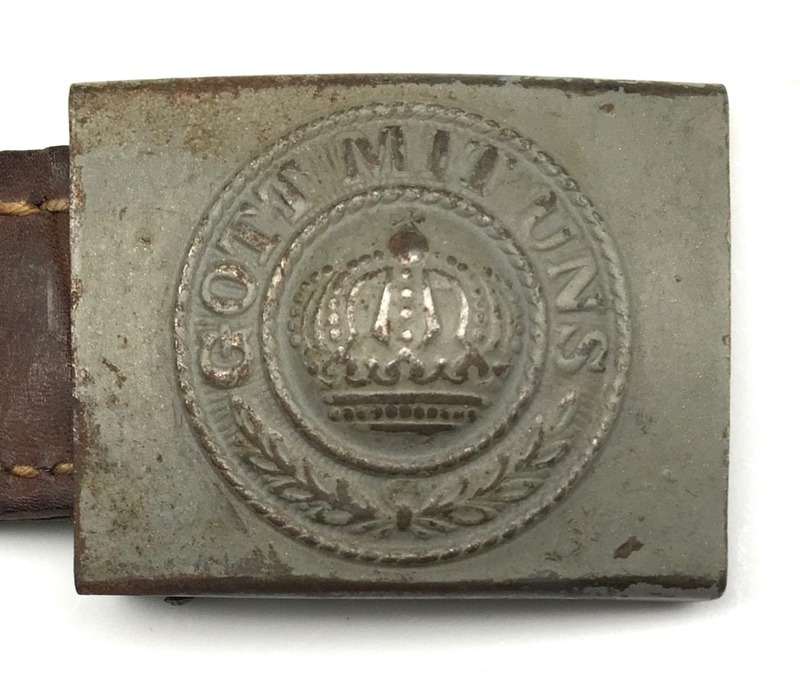 PHYSICAL DESCRIPTION: This field grey wartime buckle is in nice condition showing some age answer. 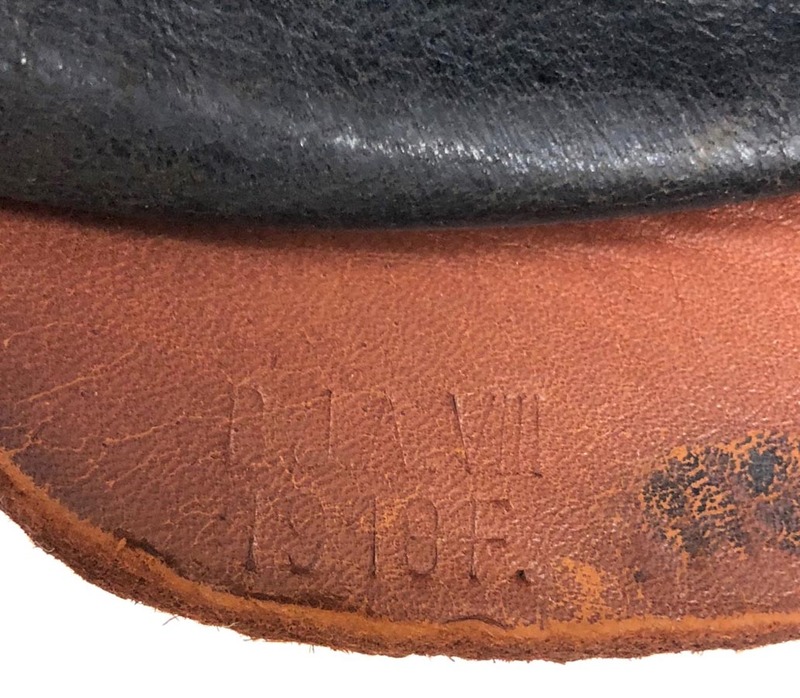 Buckle is stamped what looks like JD/17 to reverse. 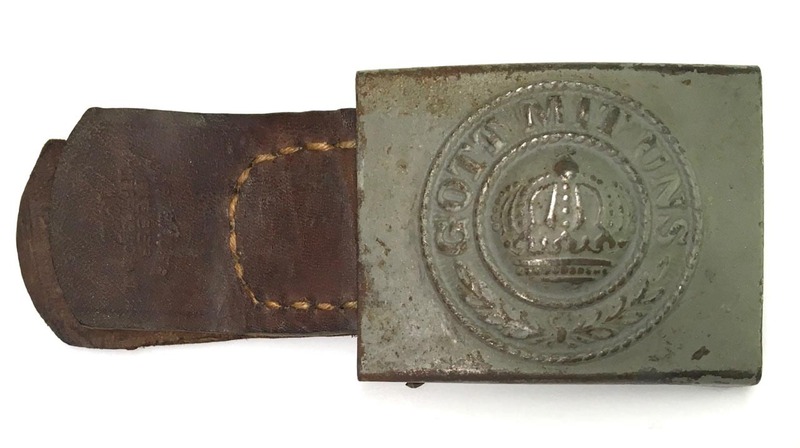 PHYSICAL DESCRIPTION: This early pre 1895 belt buckle is in nice condition showing some wear and age. 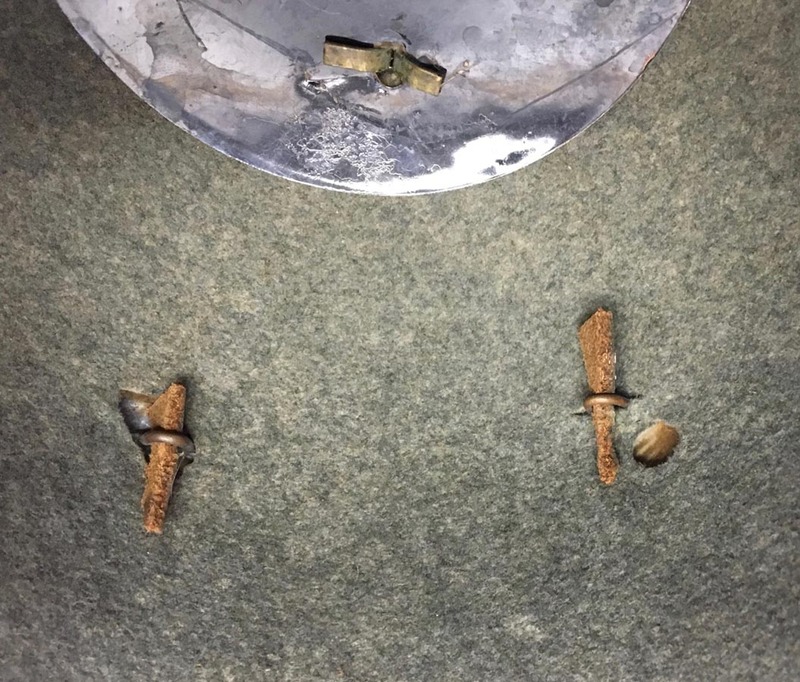 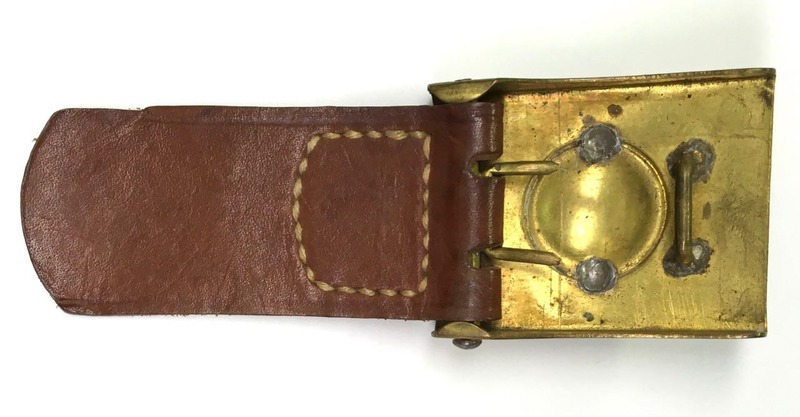 Buckle and tab are unmarked. 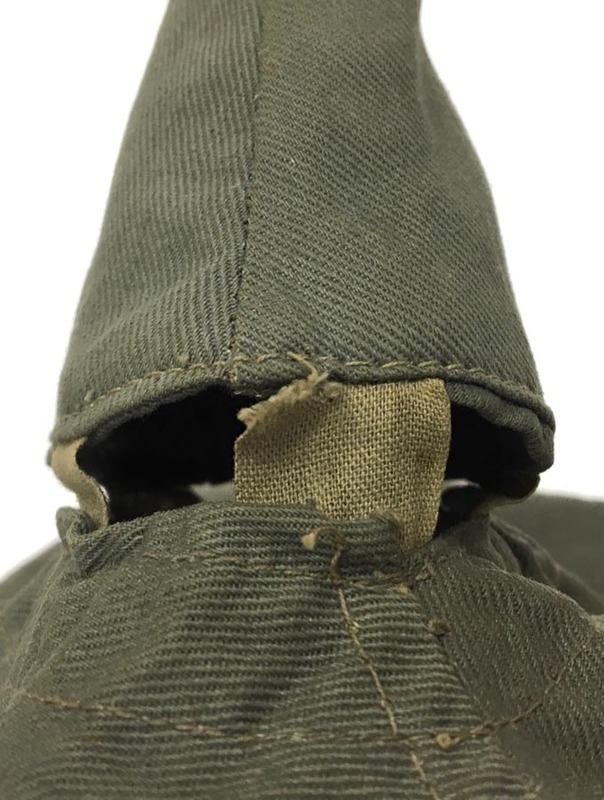 All stitching to tab is intact. 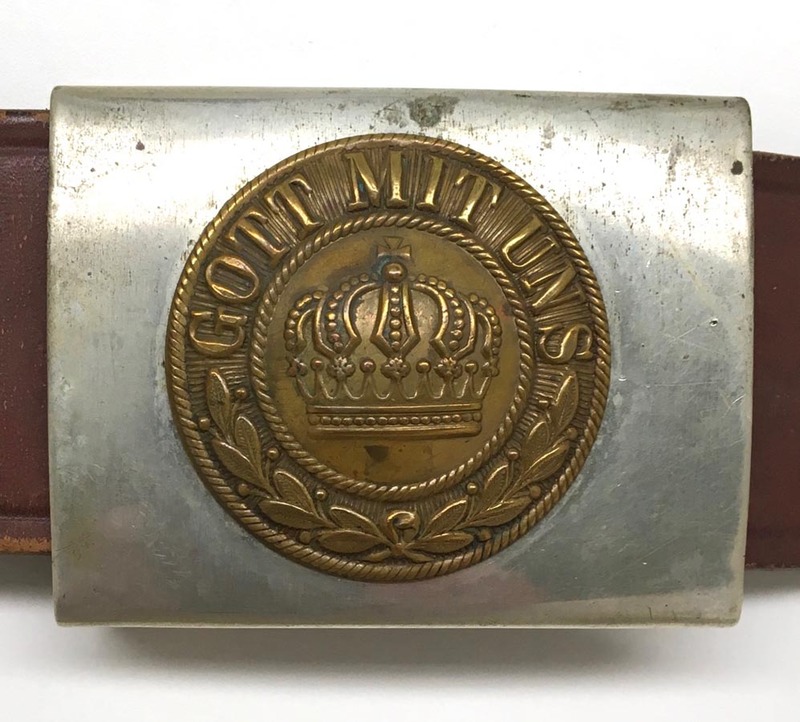 PHYSICAL DESCRIPTION: Wurttemberg buckle in real nice condition with no dings or dents. 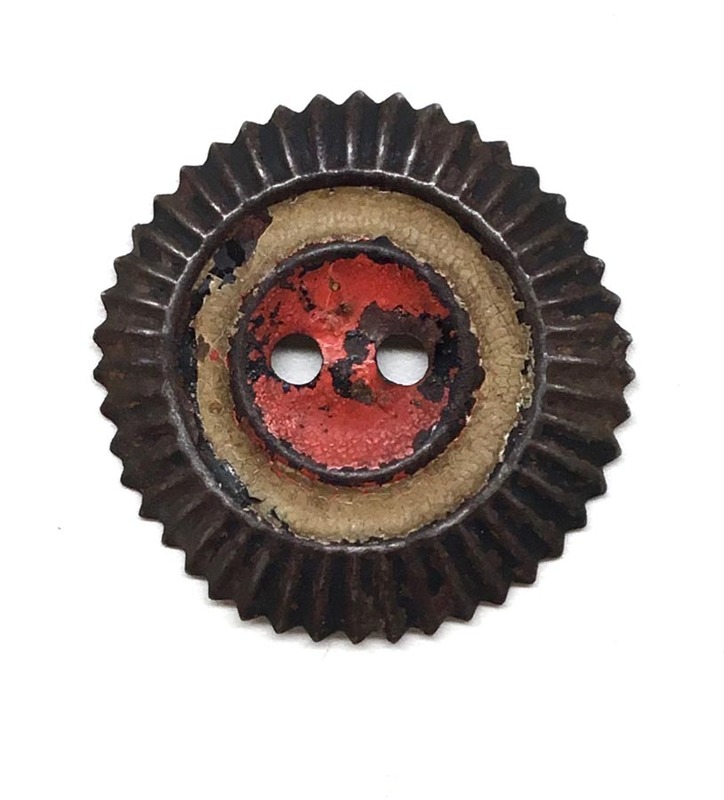 Some vertigre to backside. 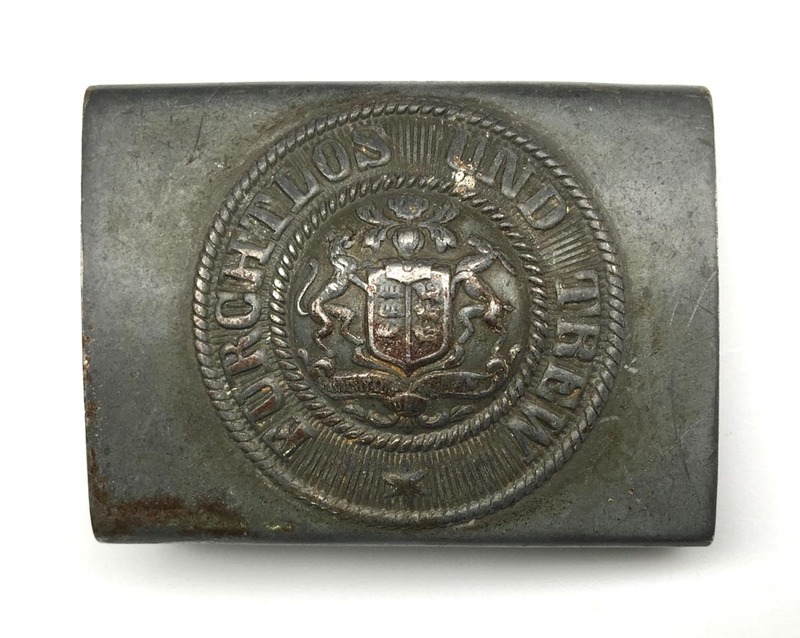 PHYSICAL DESCRIPTION: This Prussian buckle is in super condition with no dings or dents. 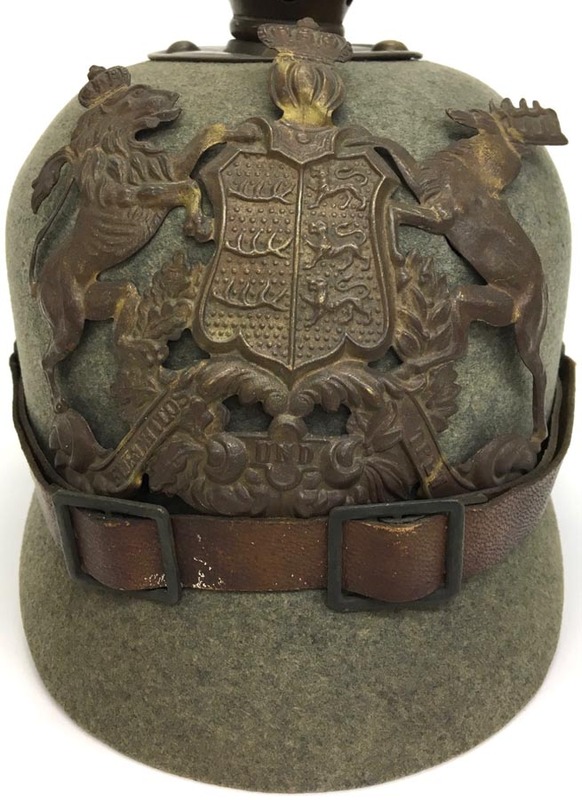 One of the nicest I've seen. 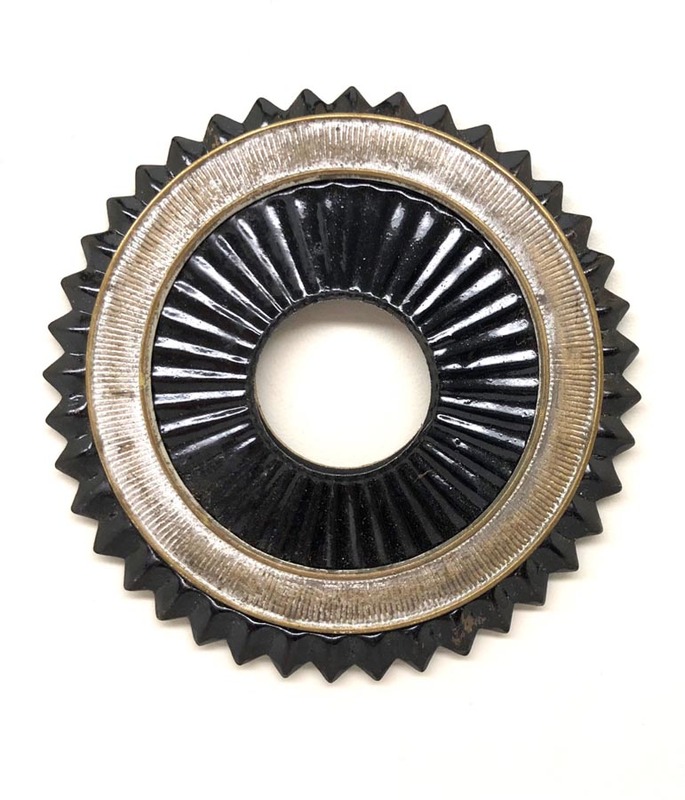 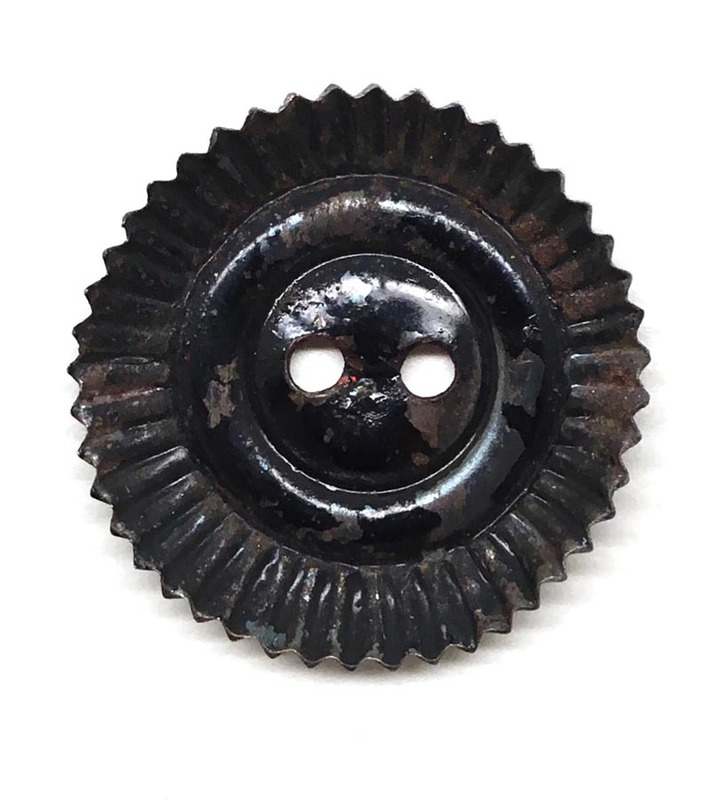 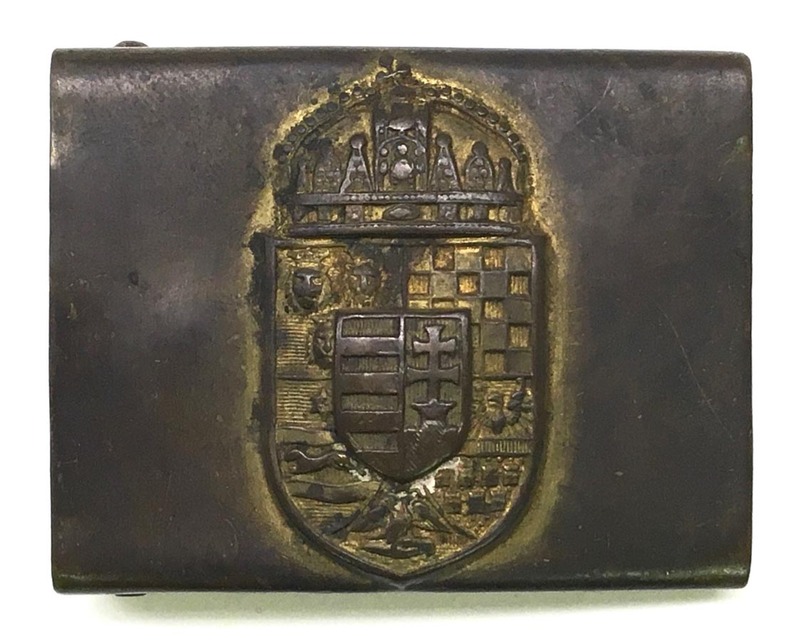 PHYSICAL DESCRIPTION: This Austro-Hungarian belt buckle is in nice condition showing some patina. 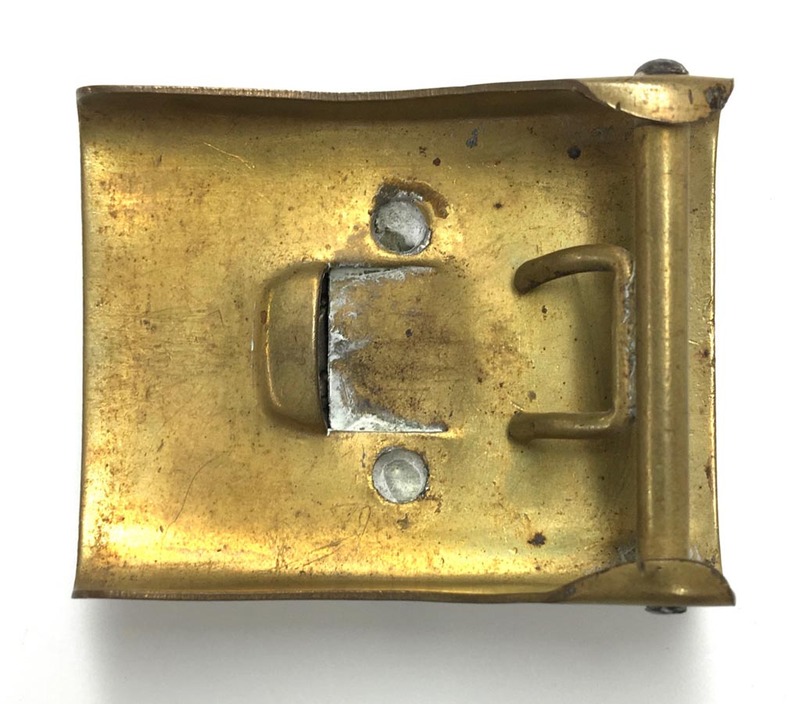 No dents or dings to buckle. 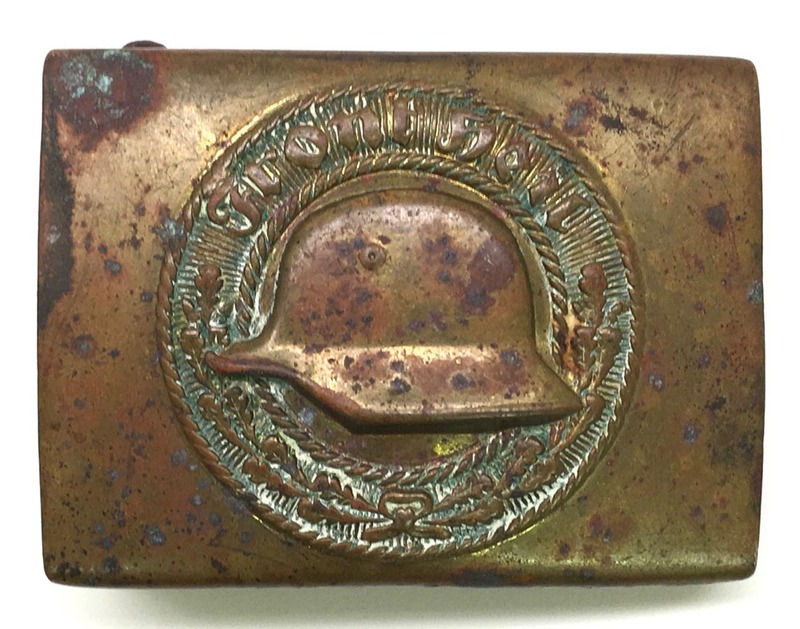 PHYSICAL DESCRIPTION: This Veterans organization belt buckle is in nice condition showing much patina to brass. 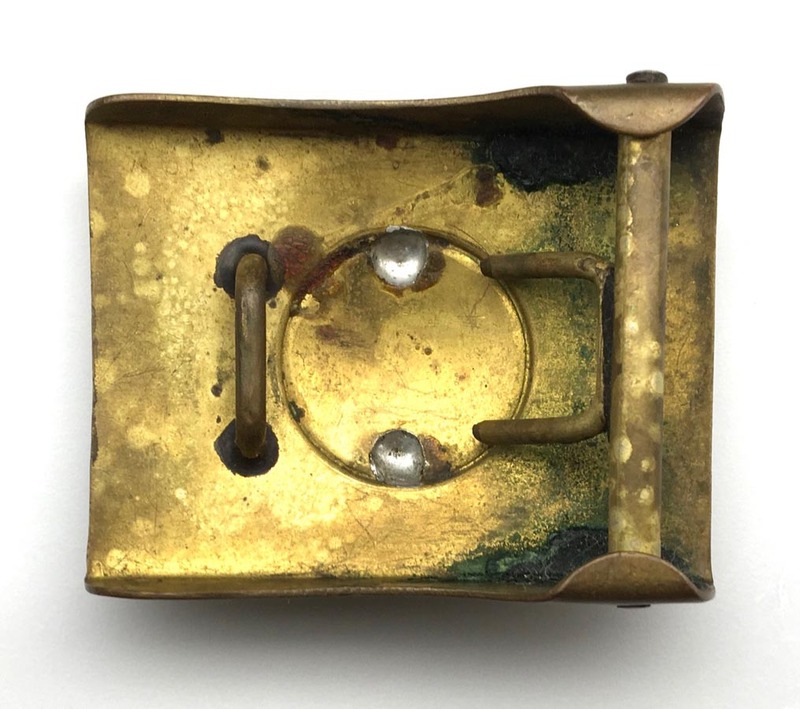 Buckle is complete with prong bar , prongs and catch. 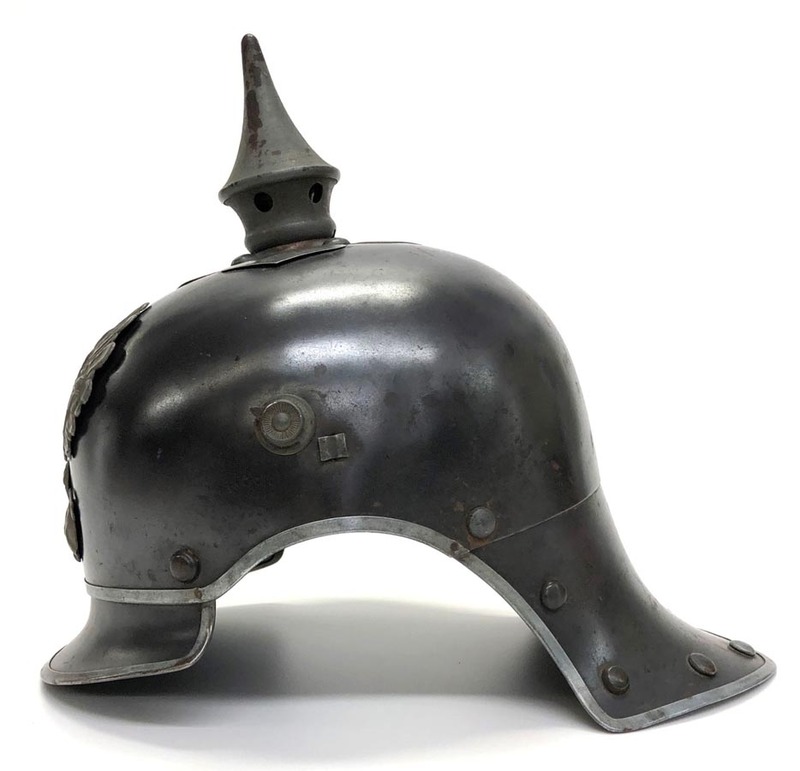 PHYSICAL DESCRIPTION: This Prussian Ersatz helmet is in nice condition but unfortunately the liner is gone. 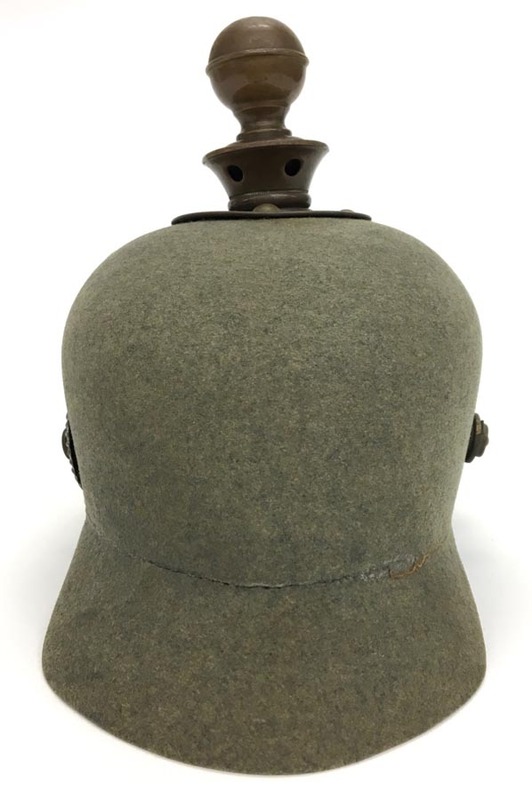 Body is nice and solid with no damage. 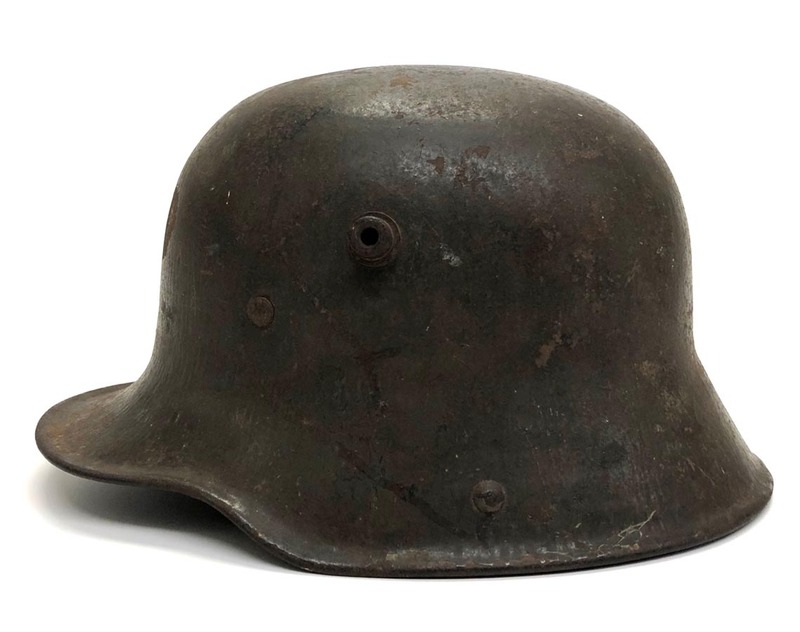 Frontplate is also nice with no damage. 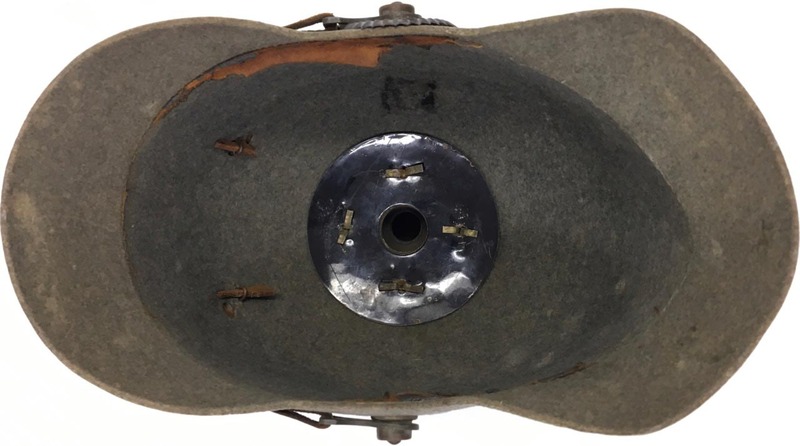 Both side lugs are present. 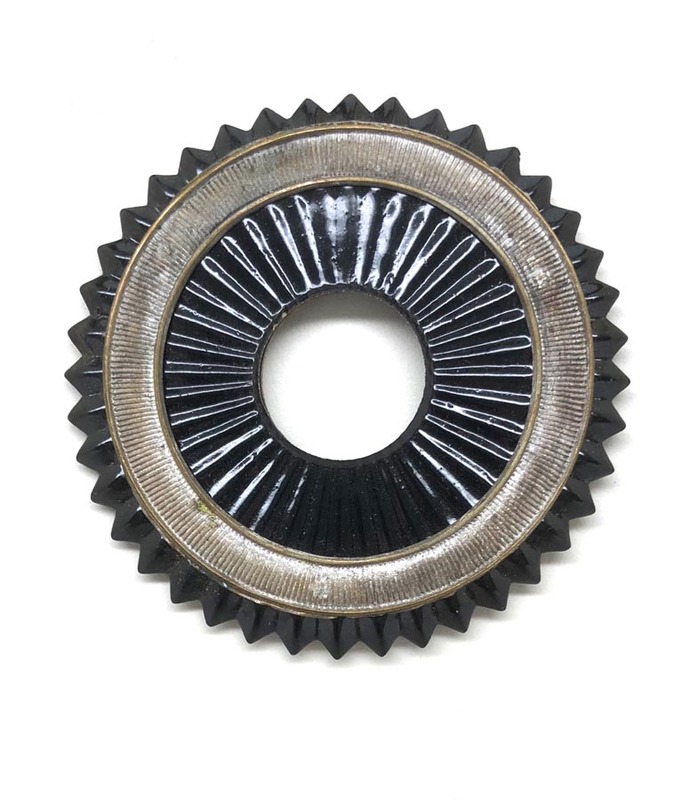 Spike is the non-removable type and is also very nice with no dings or dents. 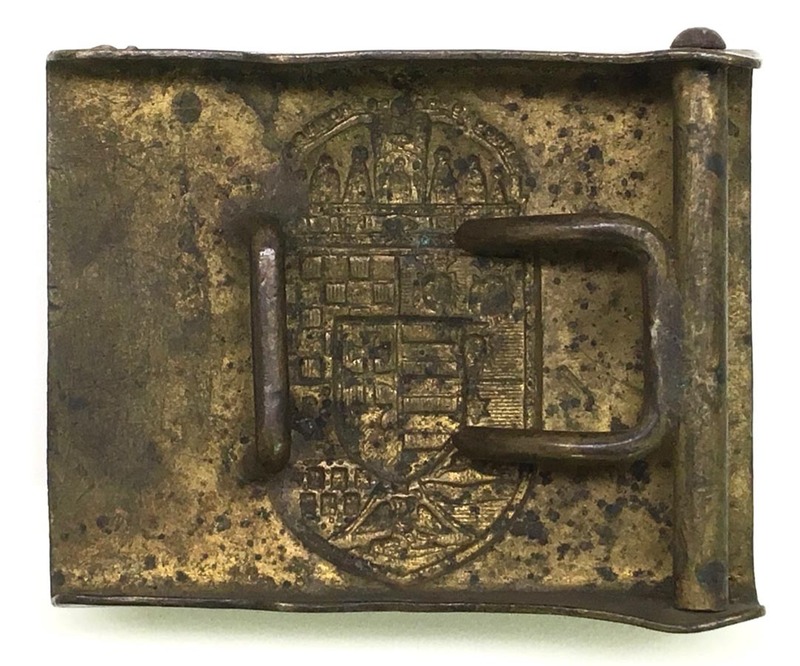 PHYSICAL DESCRIPTION: This Prussian belt and buckle are in real nice condition for their age. 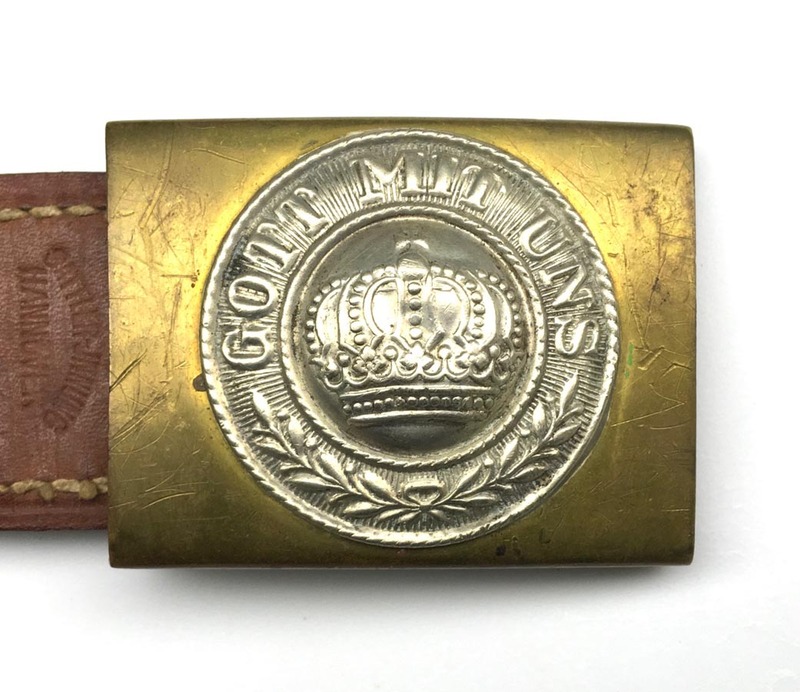 Scarce pattern buckle with a brass roundel on a silver buckle. 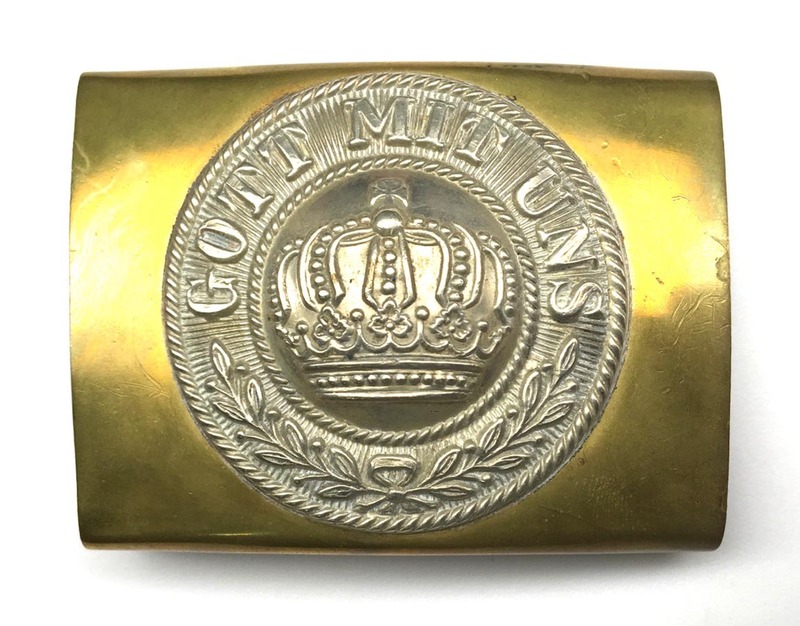 Usually they are encountered with a silver roundel on a brass buckle. 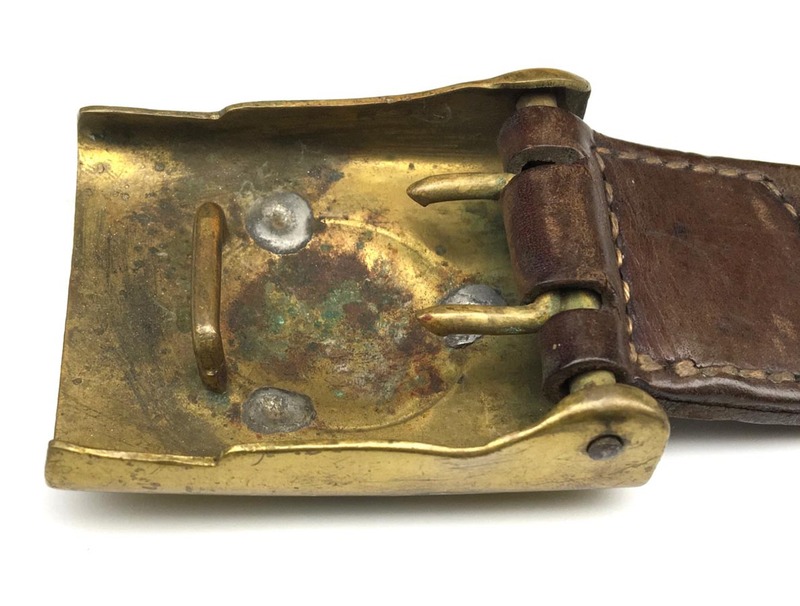 Belt is real nice and solid with all stitching intact. 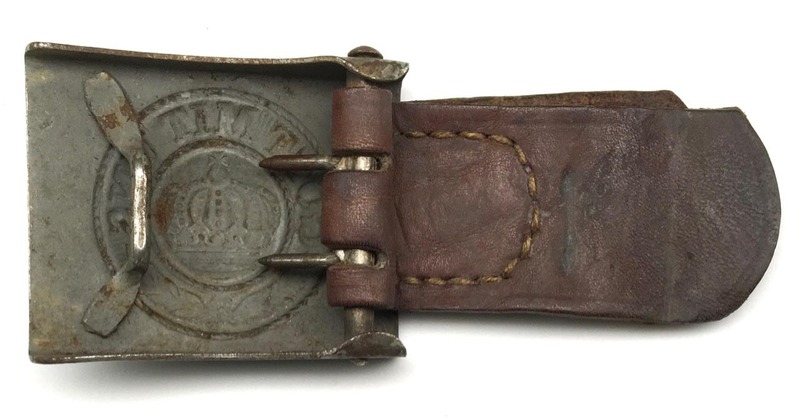 No maker marks on belt or buckle. 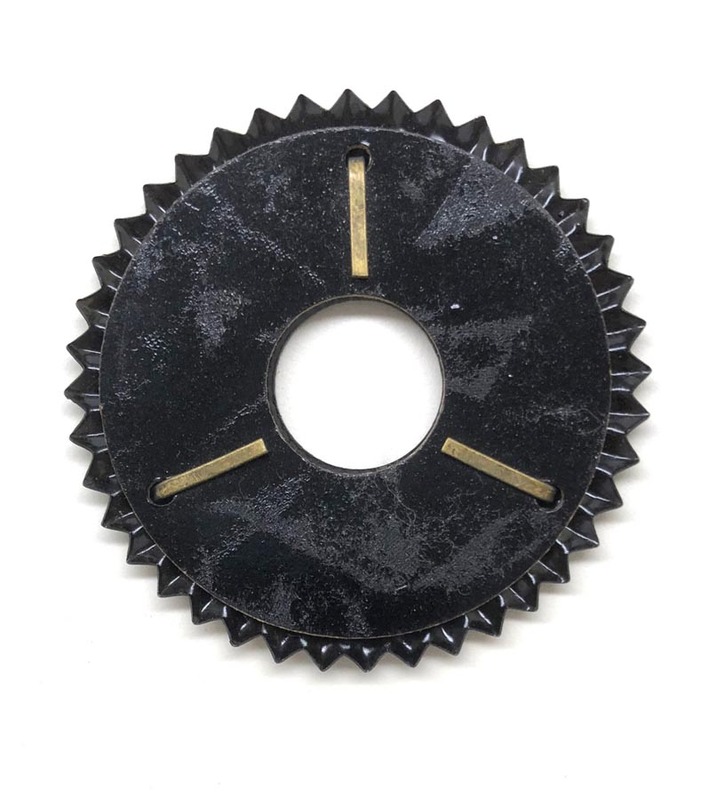 Beautiful set that will definitely clean up if so desired. 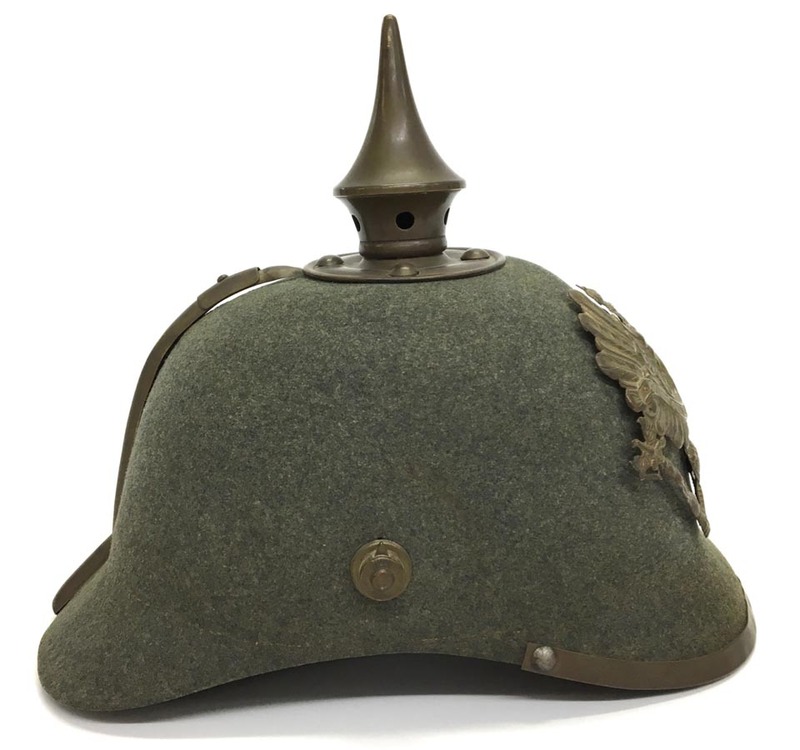 PHYSICAL DESCRIPTION: This WW1 German National Cap cockade is in fair condition showing some age and wear. 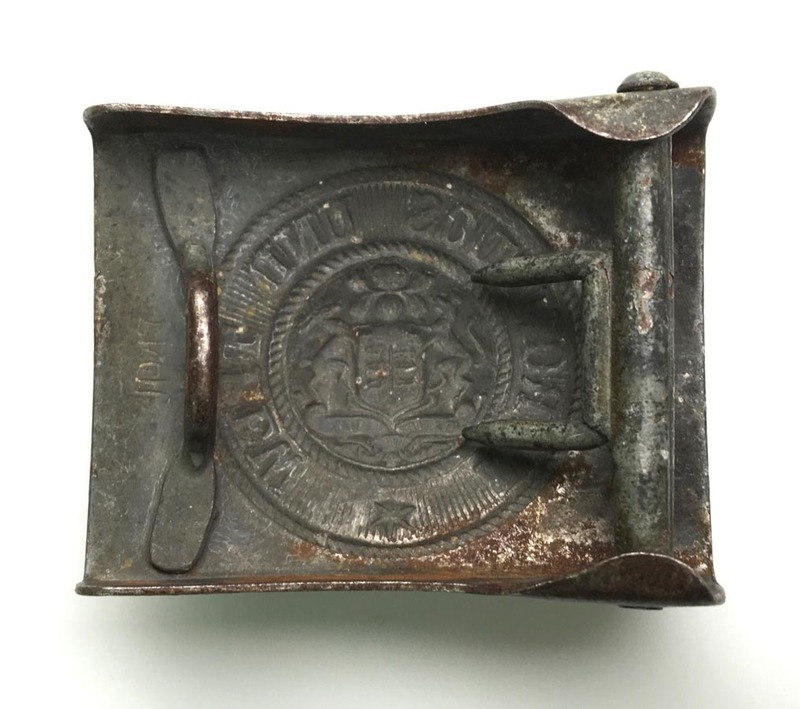 Cockade measures 1 inch across. 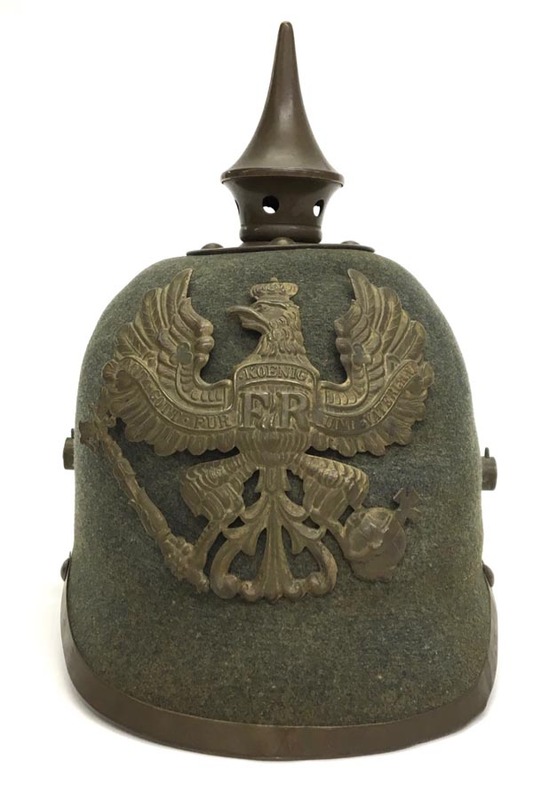 PHYSICAL DESCRIPTION: This Prussian Pioneer EM Pickelhaube is in nice condition showing some age and wear. 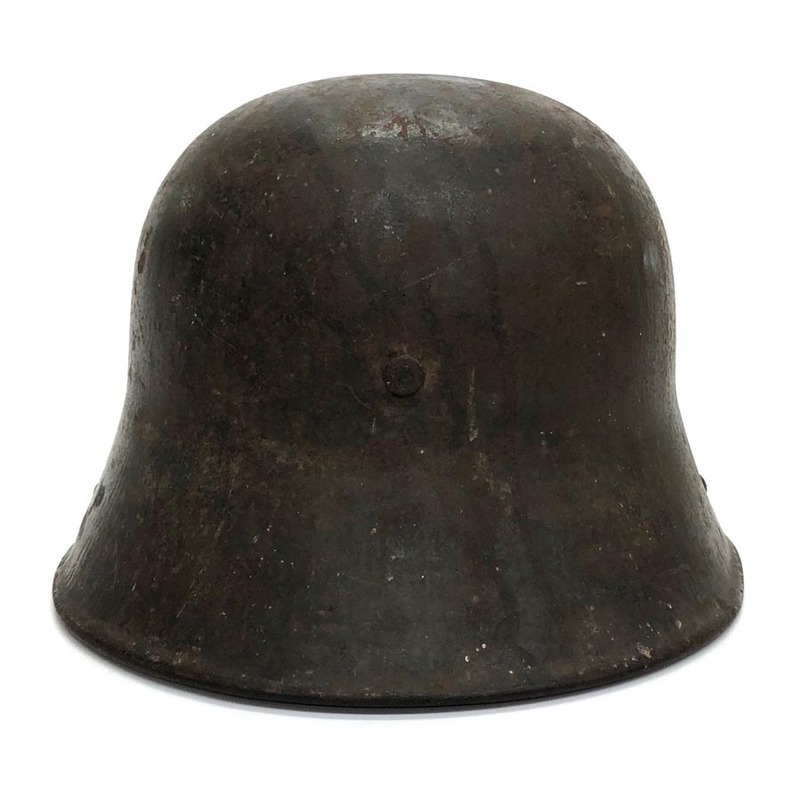 Body is solid with no damage. 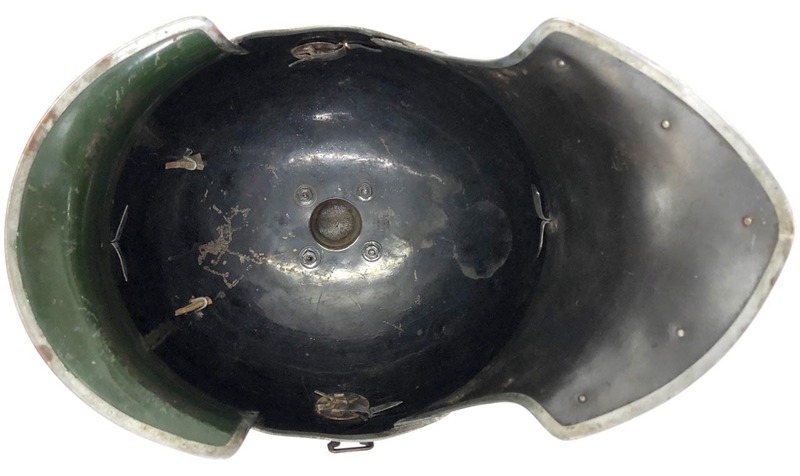 Both front and rear visor are still solidly stitched to the body. 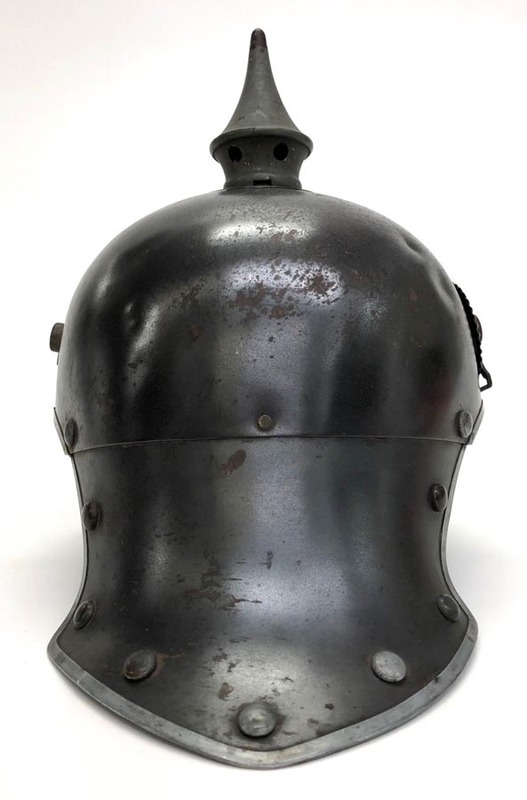 Leather chinstrap is dry but all there. 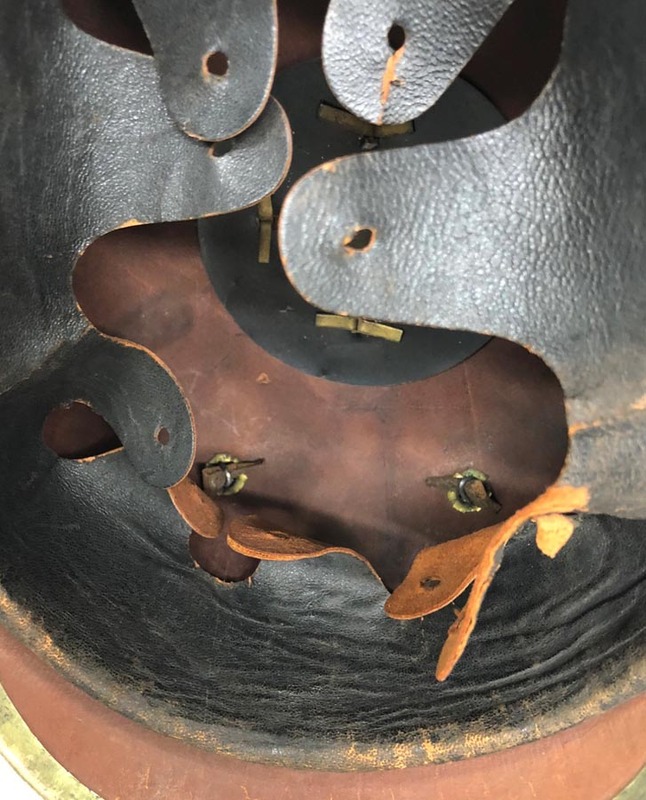 Leather liner is all there with one finger torn at drawstring hole. 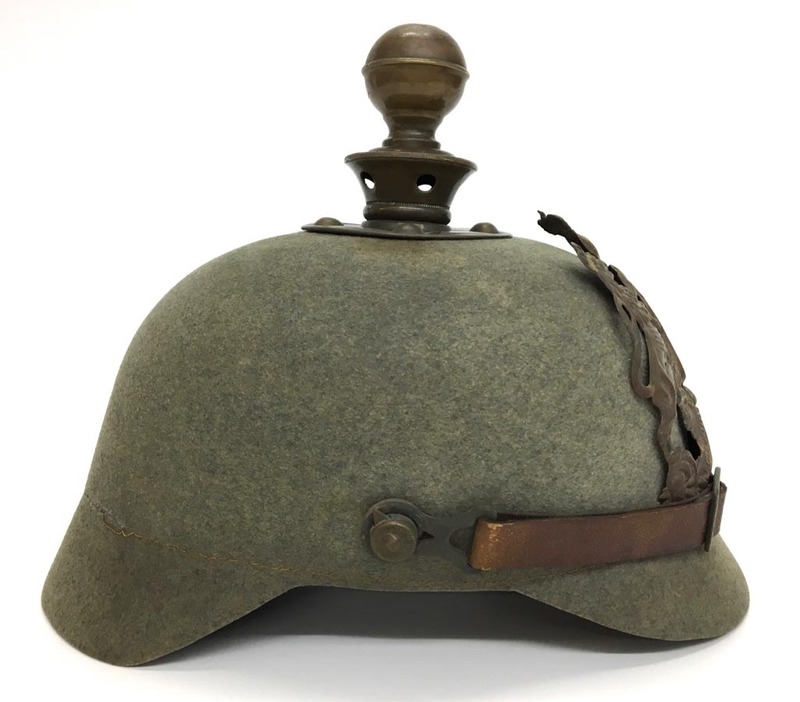 Helmet is 1918 dated at rear visor. 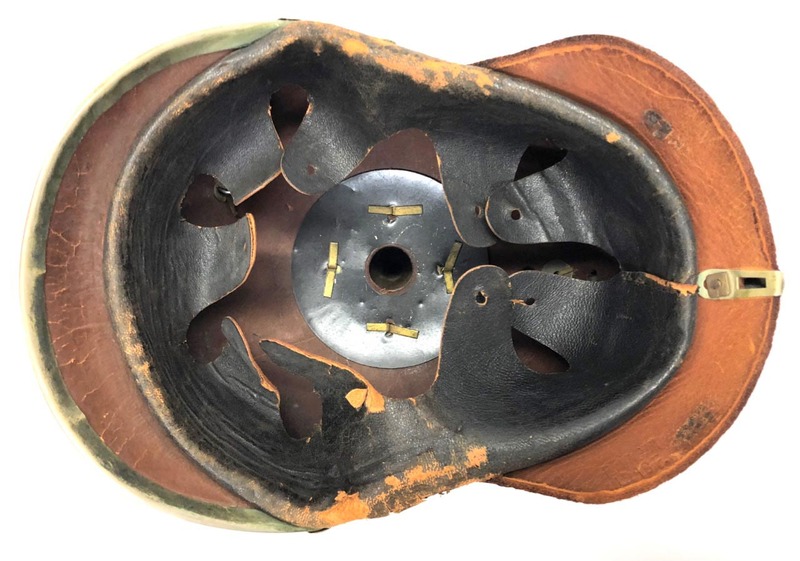 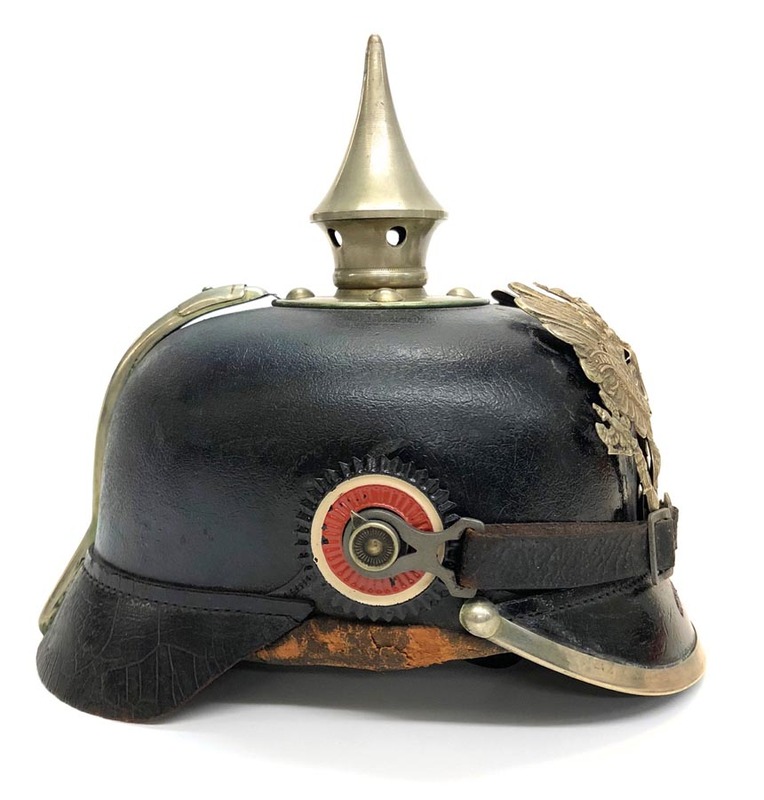 PHYSICAL DESCRIPTION: This Prussian Jager Zu Pferde Helmet is in nice condition showing some wear and age. 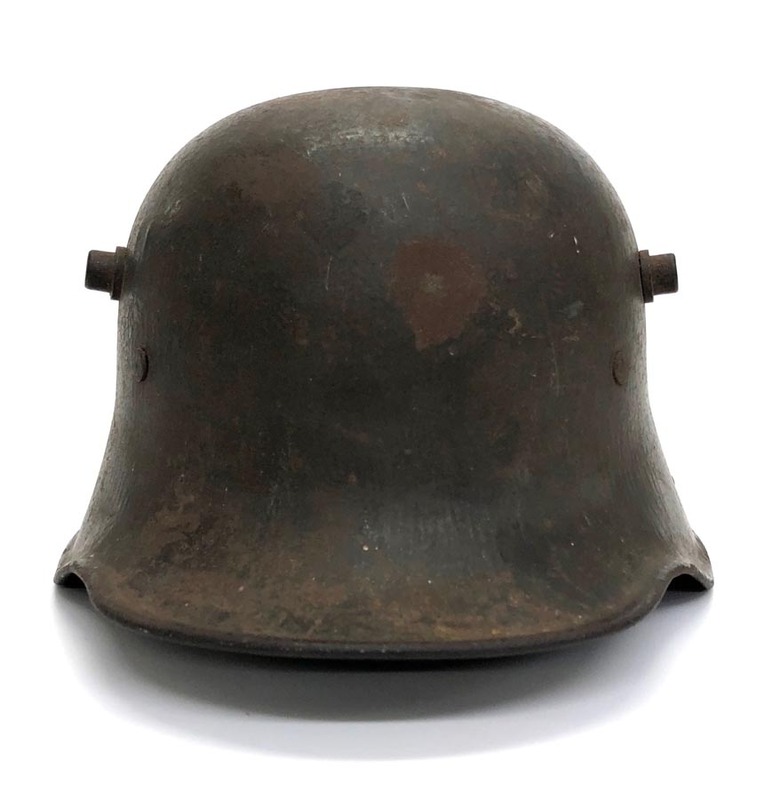 Helmet has no liner or chinstrap. 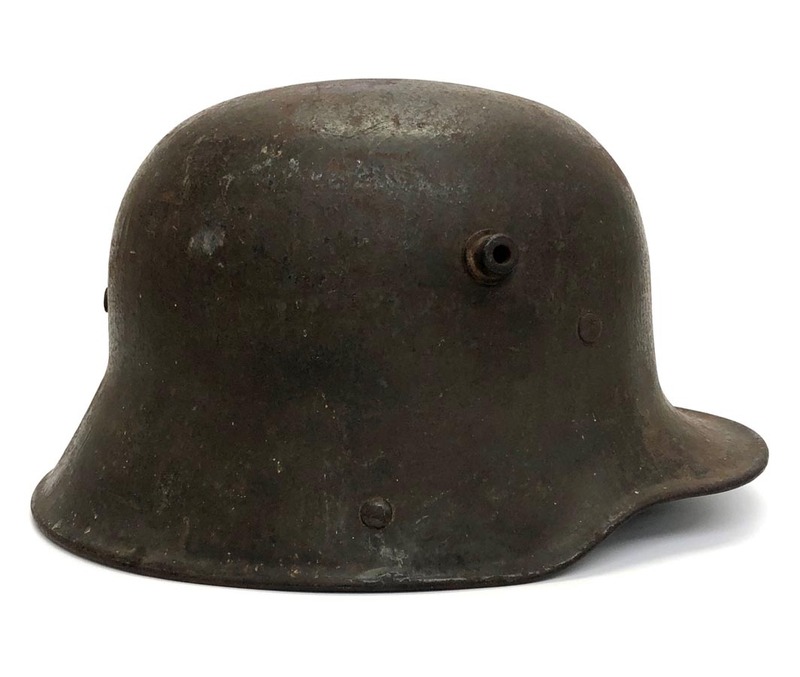 Helmet body has a couple of dings to right top side. 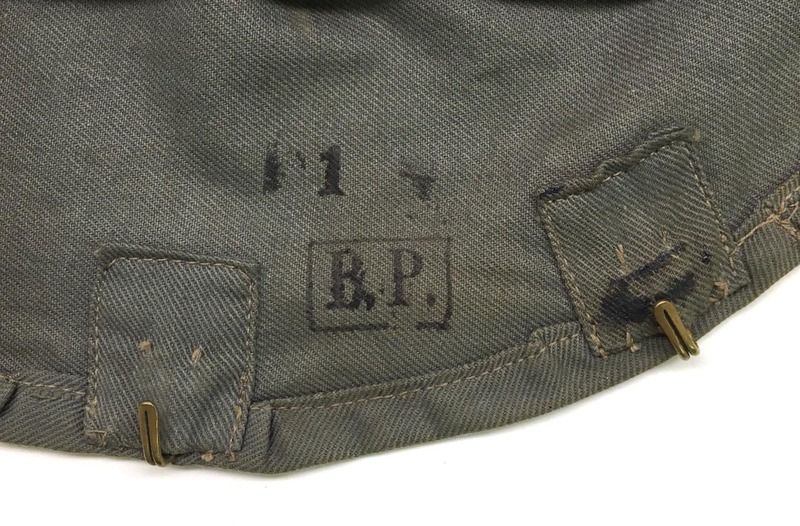 There is a number 57 to back apron and a 1916 date to interior top. 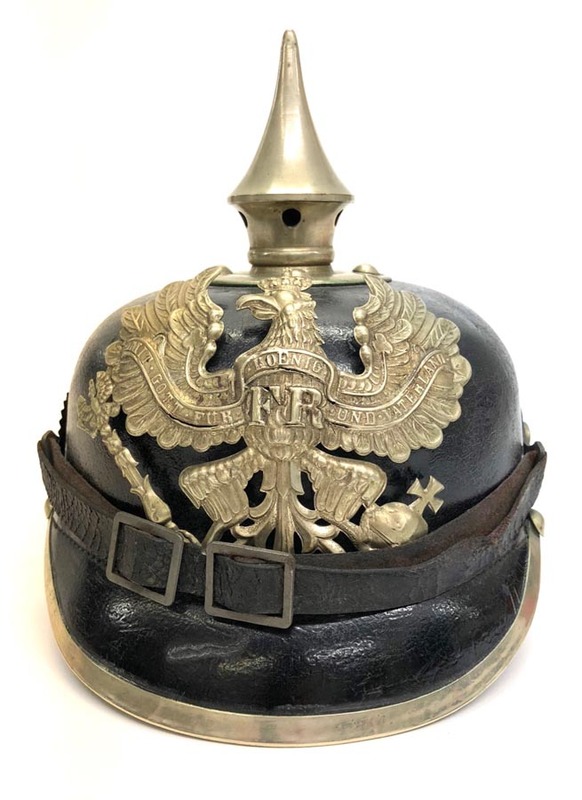 PHYSICAL DESCRIPTION: This Prussian Officers Kurassier Cockade is is in real nice condition. 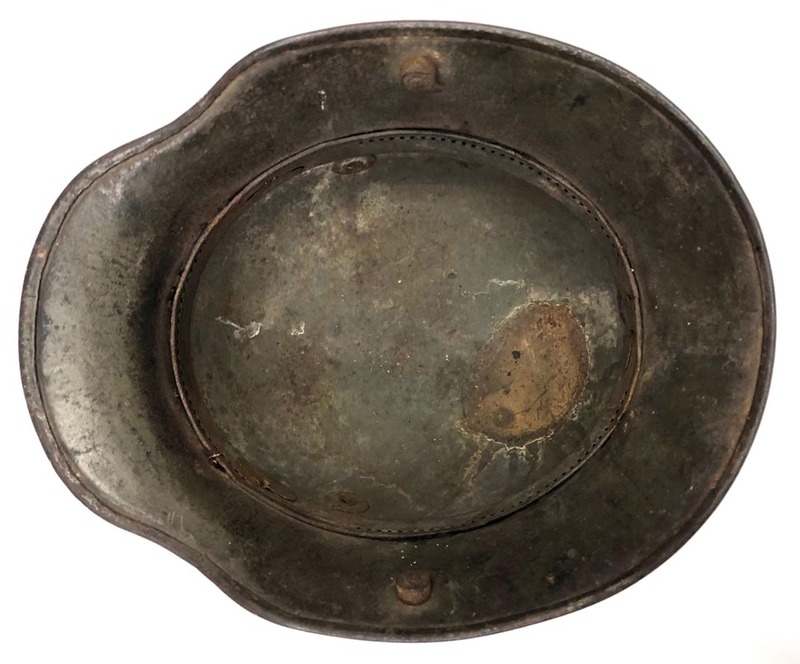 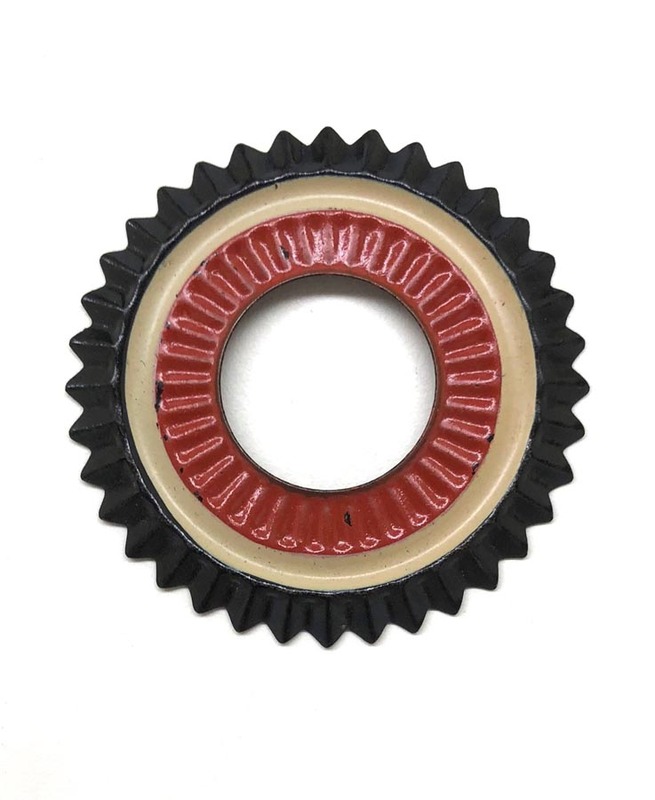 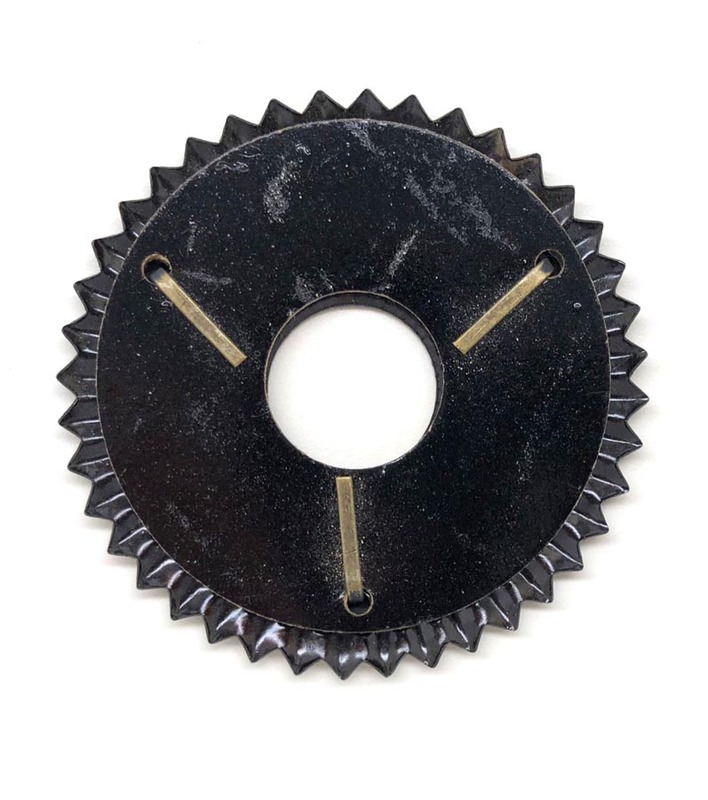 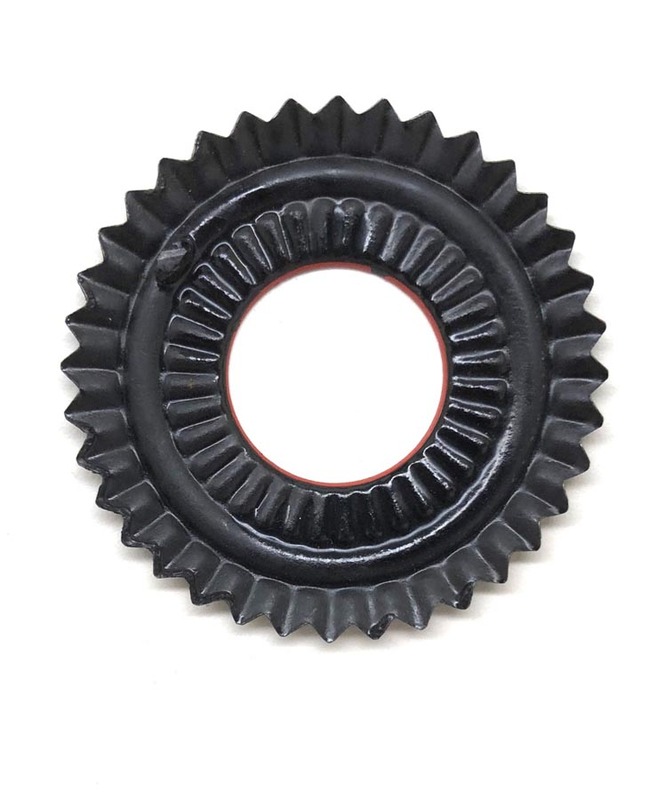 Cockade measures 2 1/2 inches across and is two piece construction. 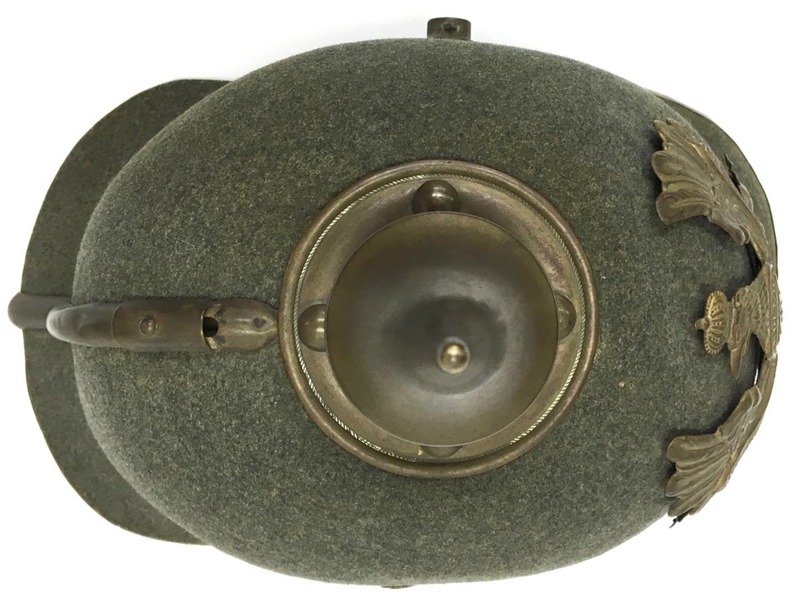 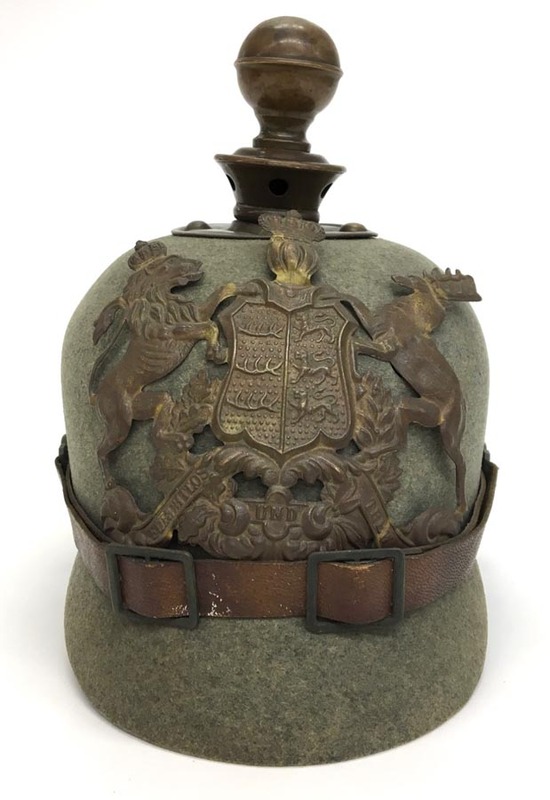 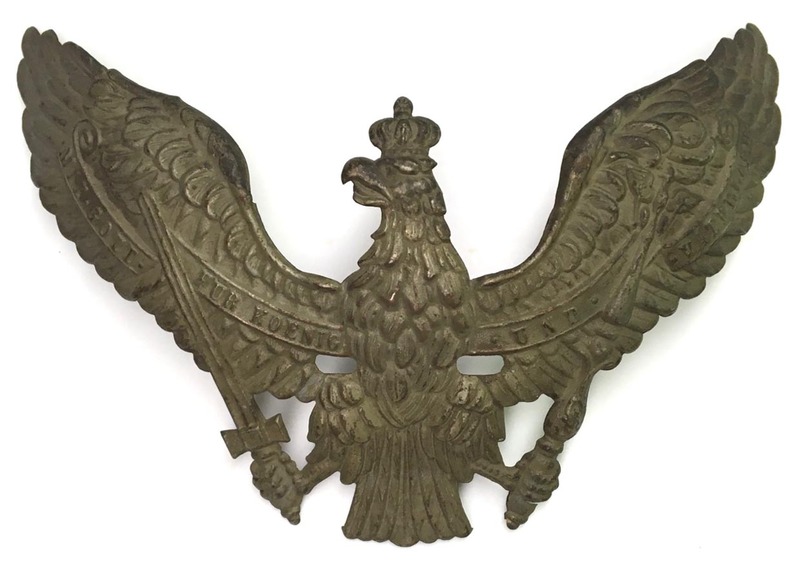 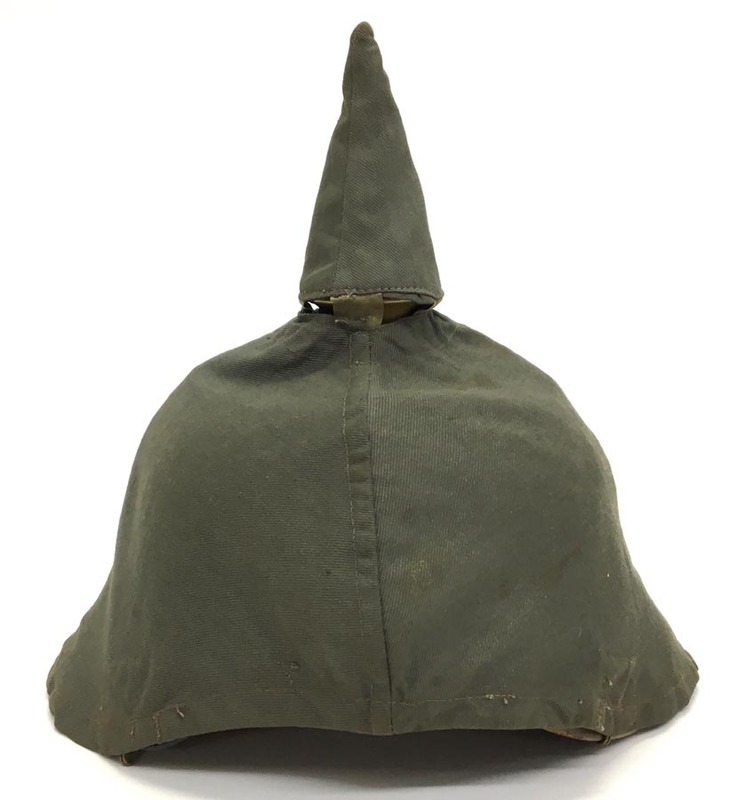 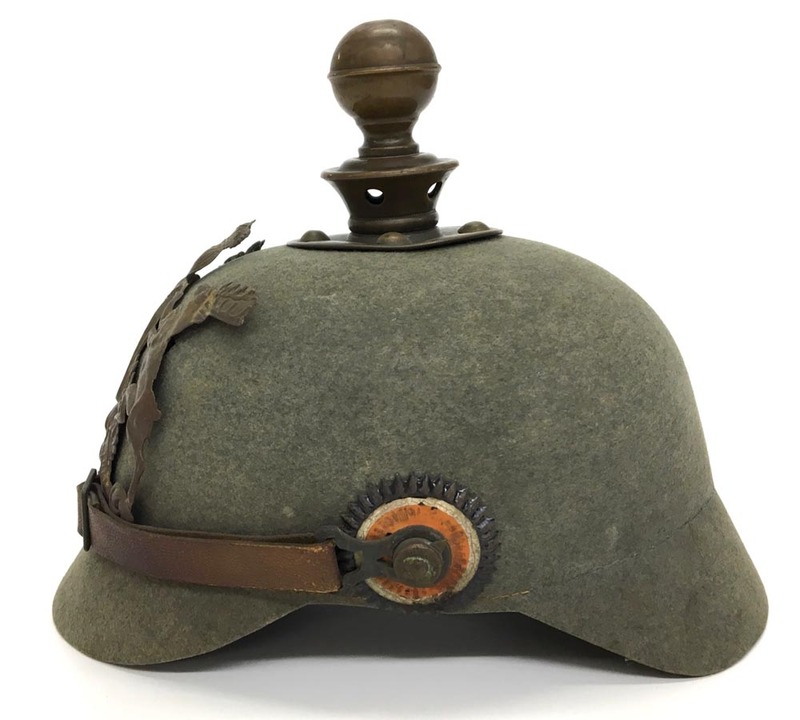 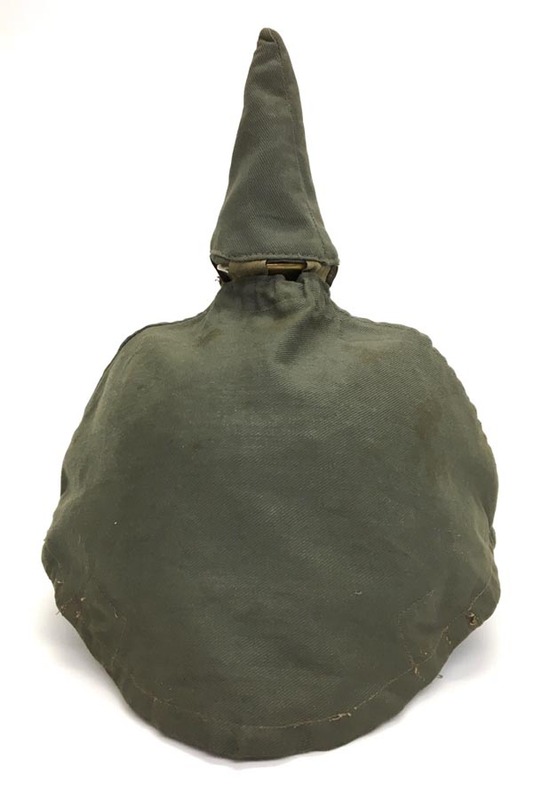 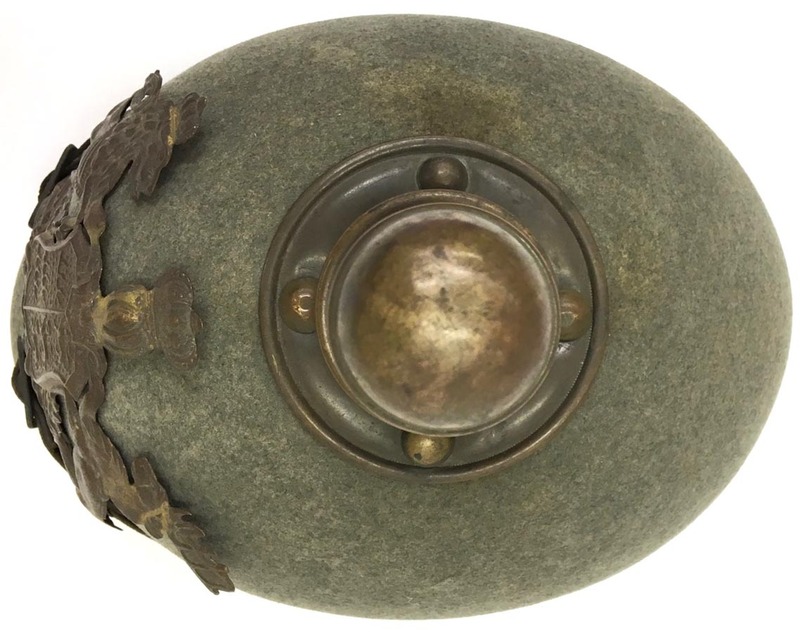 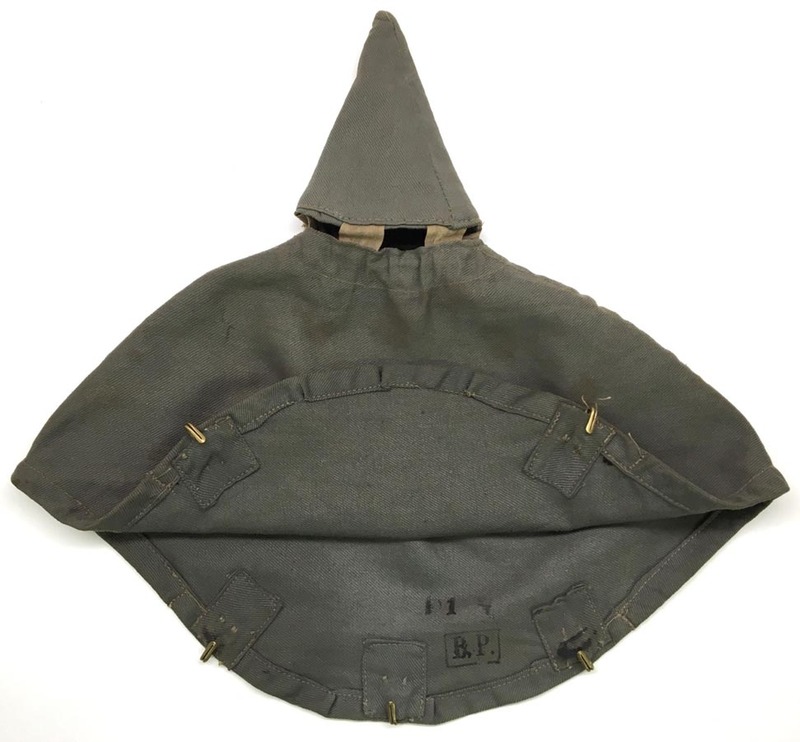 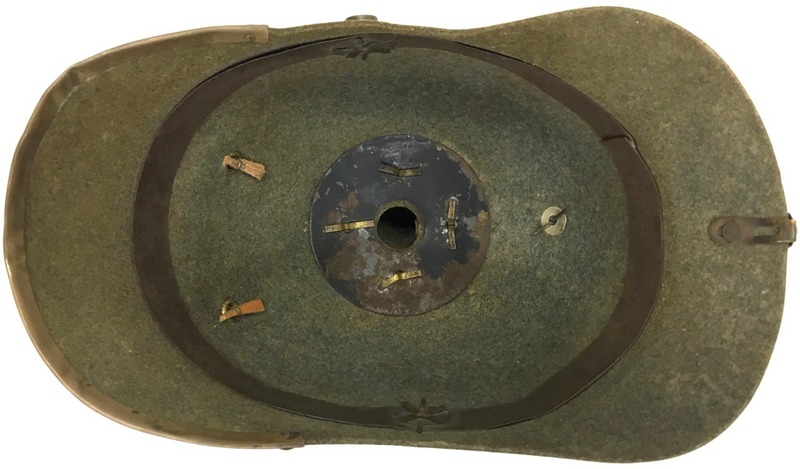 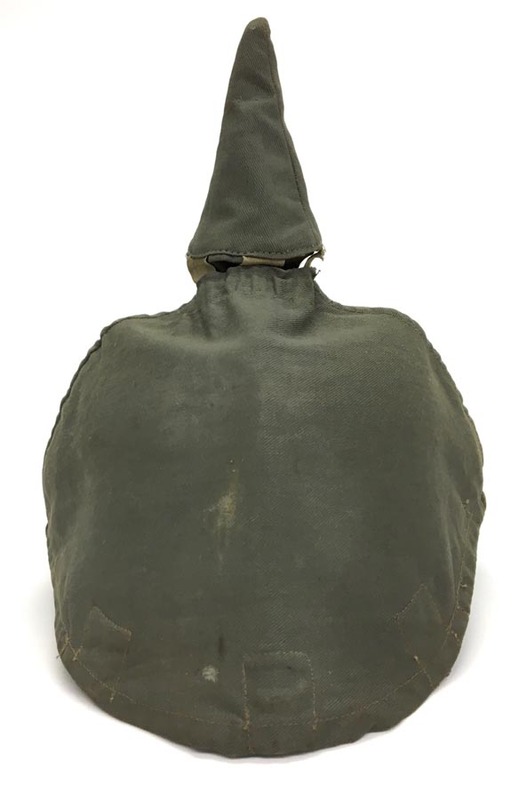 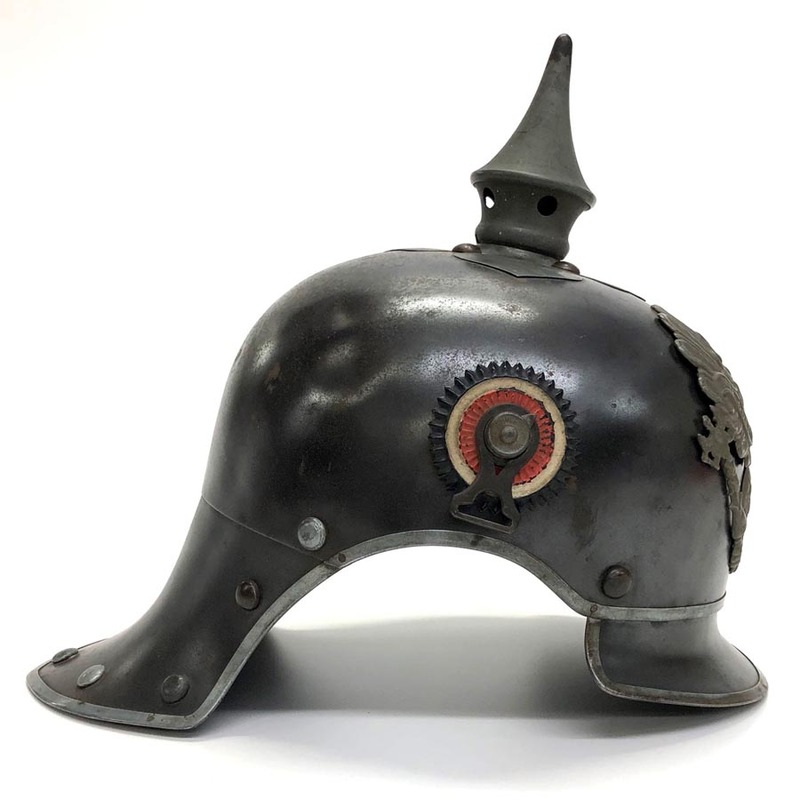 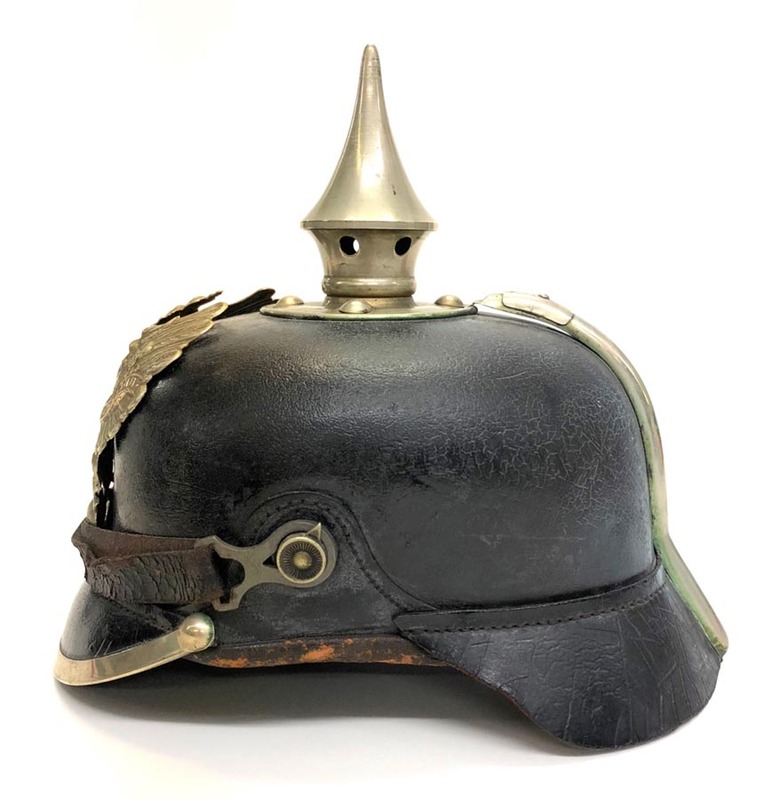 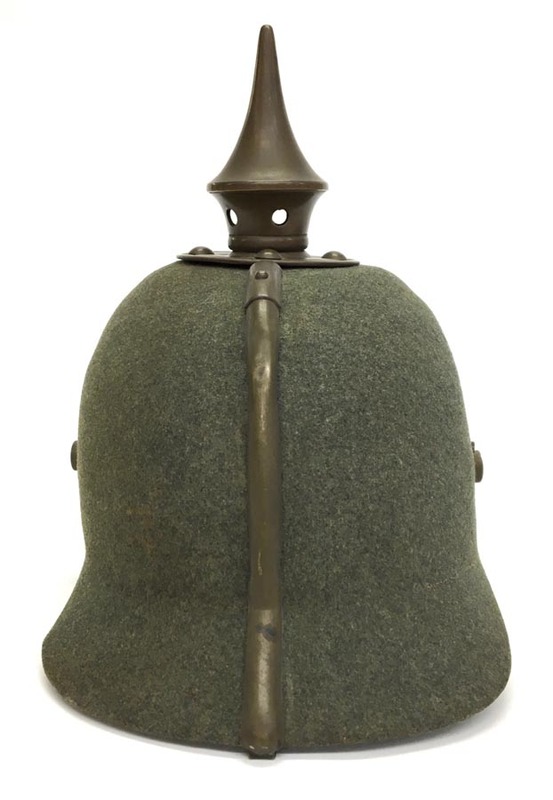 PHYSICAL DESCRIPTION: This German Pickelhaube Reichs Cockade is in real nice condition. 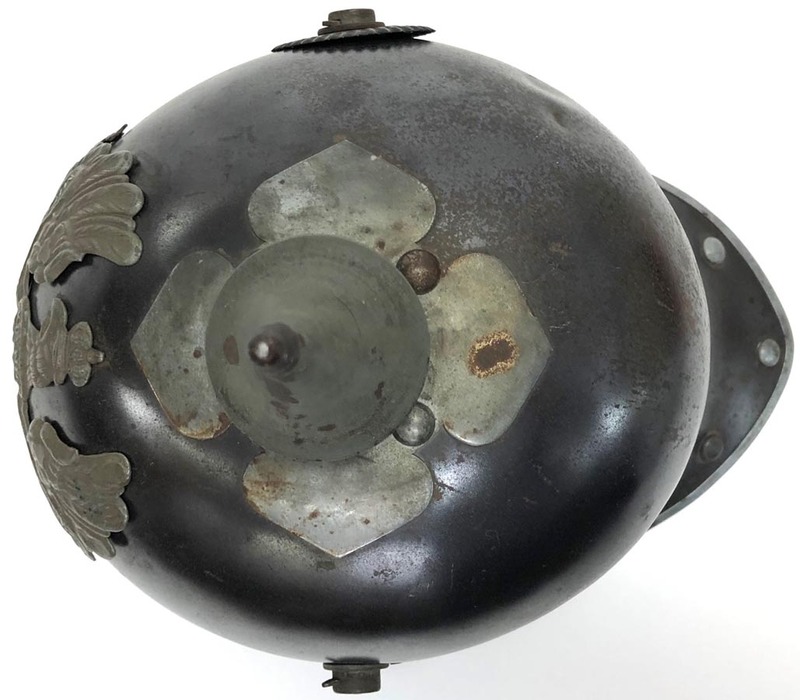 Cockade measures 1 7/8 inches across. 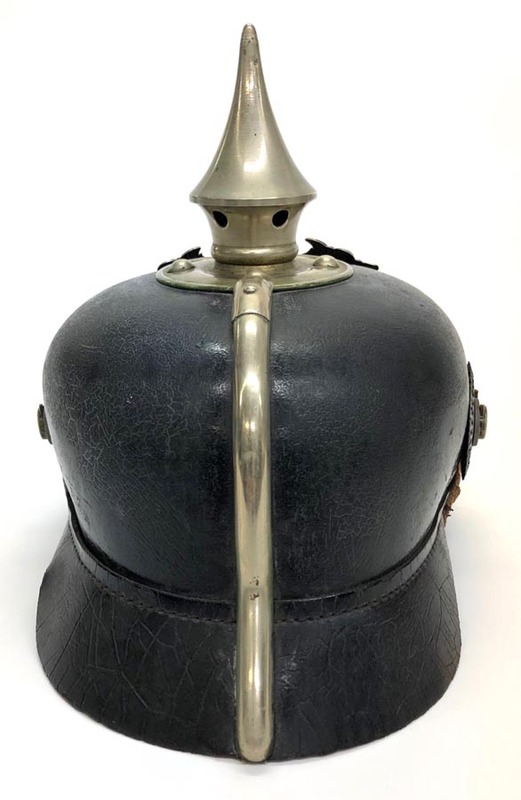 PHYSICAL DESCRIPTION: This Prussian Officers Kurassier Cockade is in real nice condition. 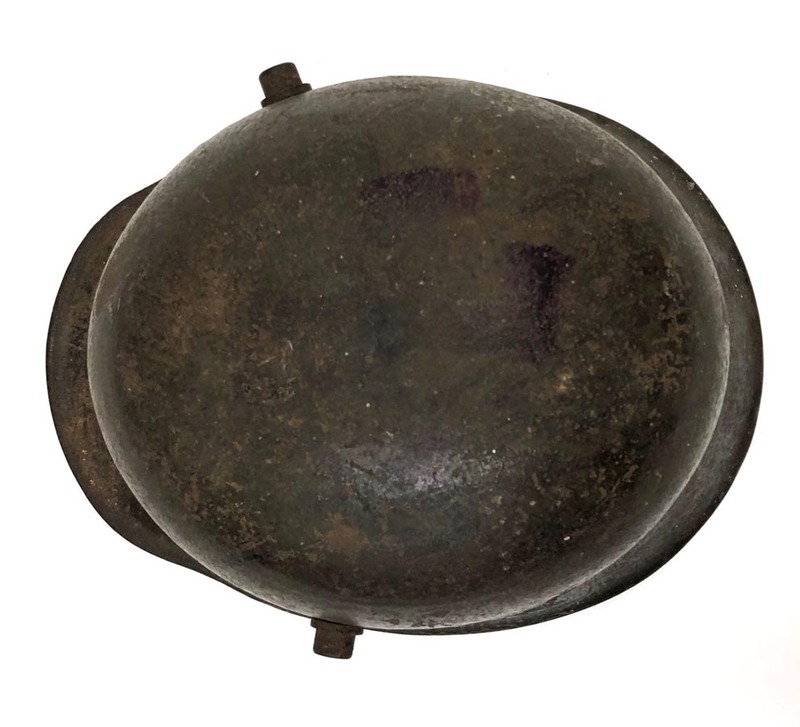 Cockade measures 2 1/2 inches across and is two piece construction. 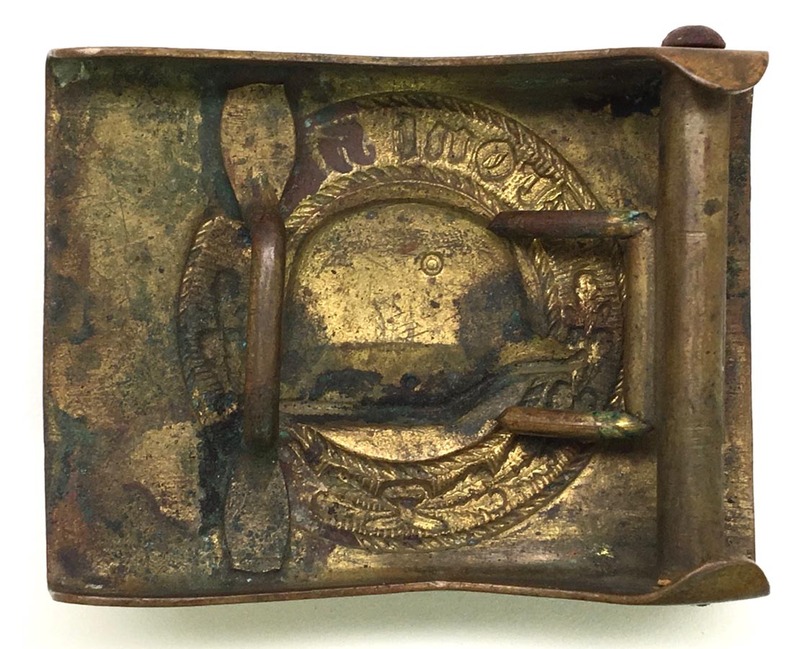 PHYSICAL DESCRIPTION: This WW1 Prussian EM/NCO Belt Buckle is in real nice condition showing some very light wear. 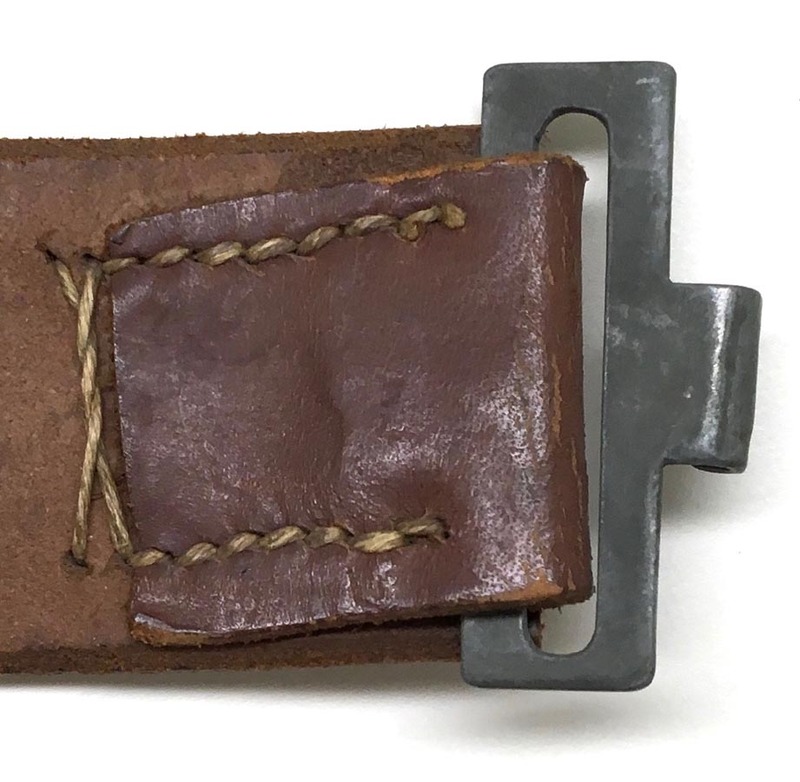 Buckle is dent free and nicely D.R.G.M. 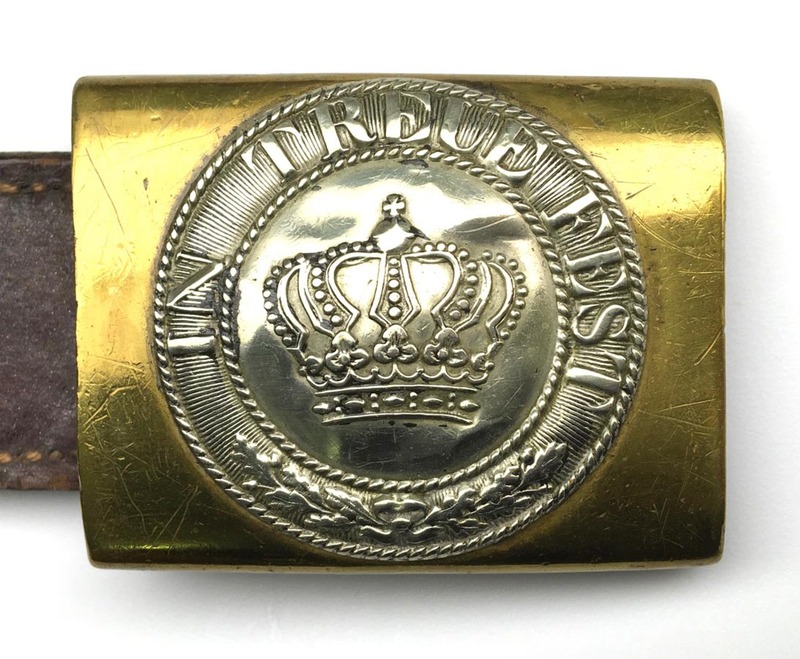 marked to prong bar. 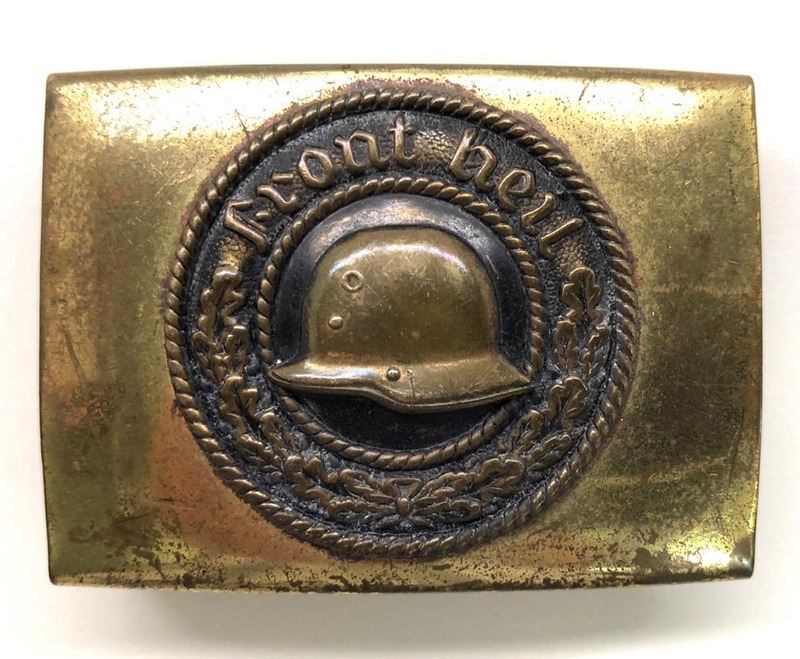 PHYSICAL DESCRIPTION: This WW1 German Veterans Front Heil Belt Buckle is in nice condition showing some age and wear. 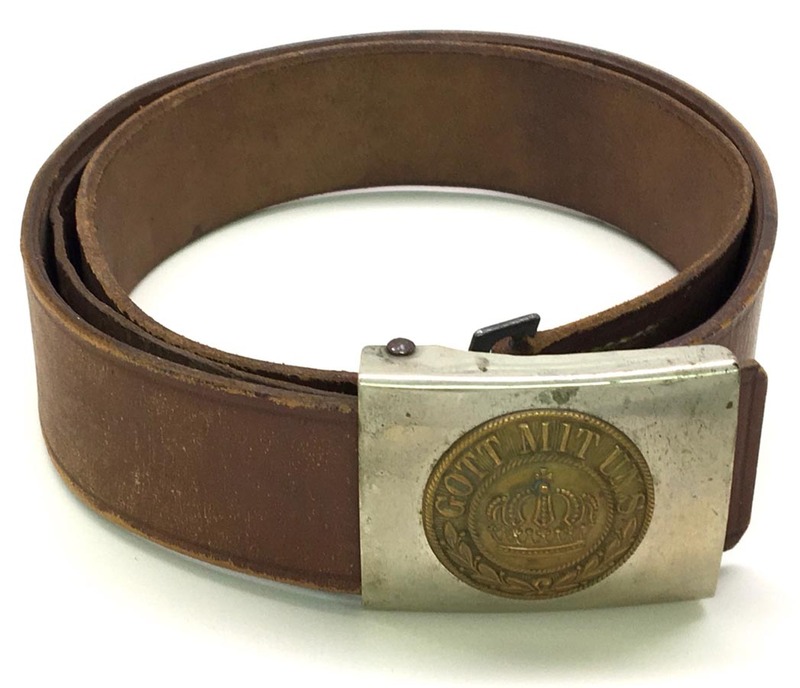 Buckle is dent free. 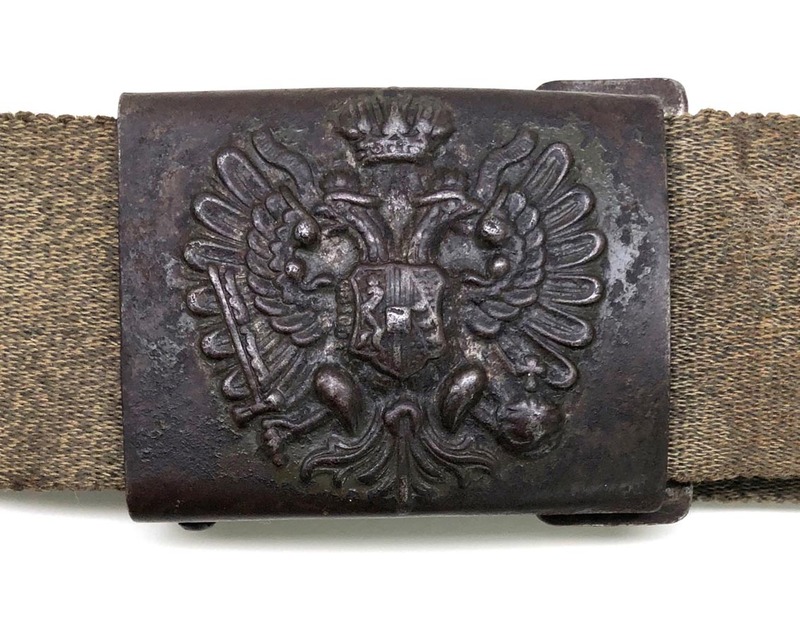 PHYSICAL DESCRIPTION: This WW1 Austro-Hungarian Cloth Belt & Buckle are in nice condition showing some wear and age. 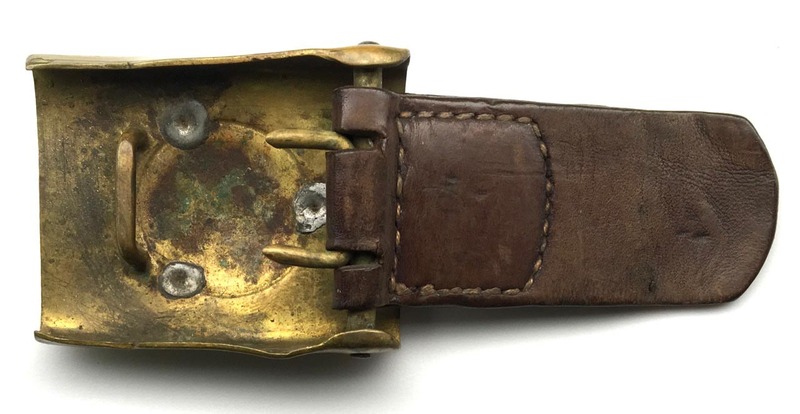 Buckle shows much wear with very little original paint. 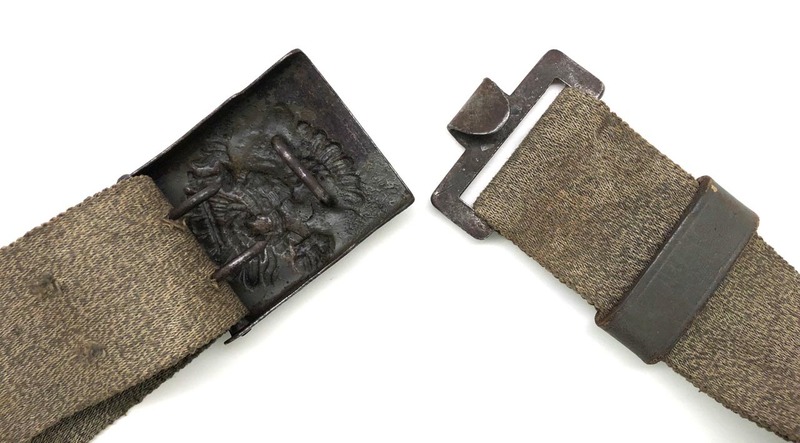 Cloth belt is nice having holes punched for the claws of the buckle. 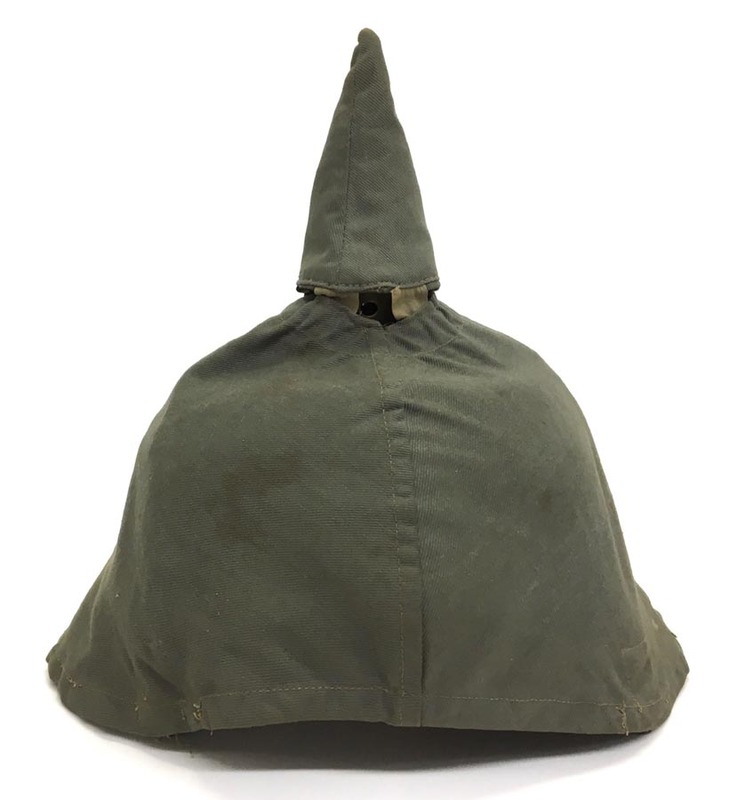 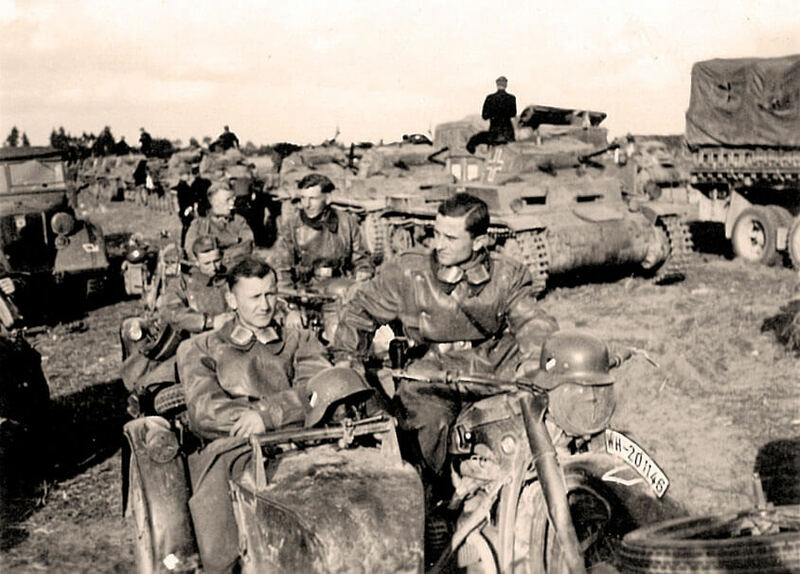 This is exactly how it was sent back after the war.